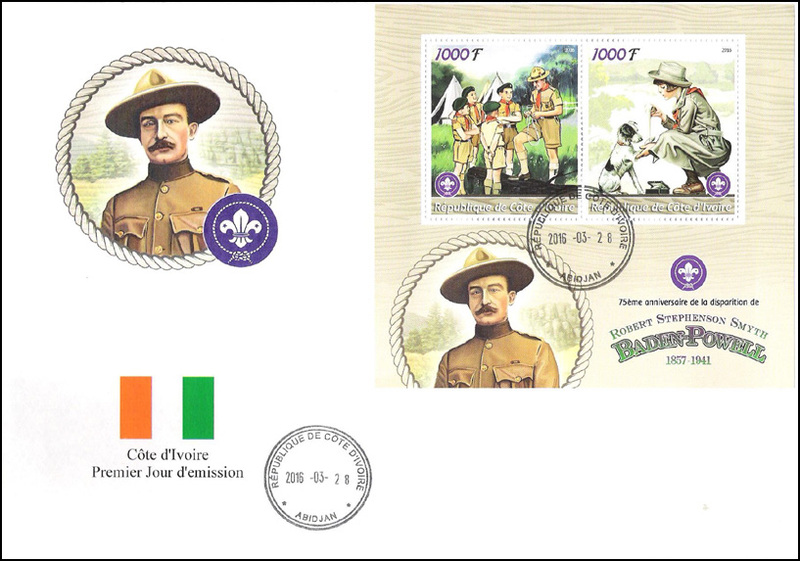 Set of two stamps issued celebrating 100 years of Scouting in Bangladesh. 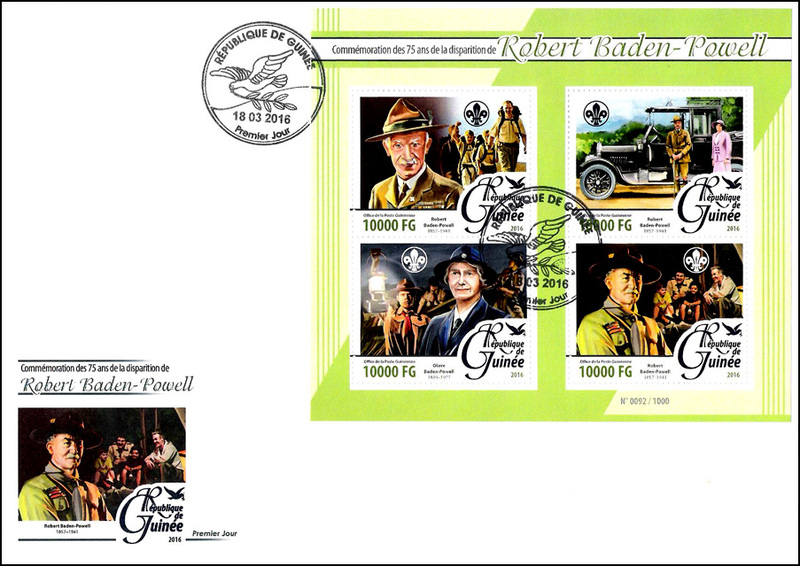 The 10 Tk. 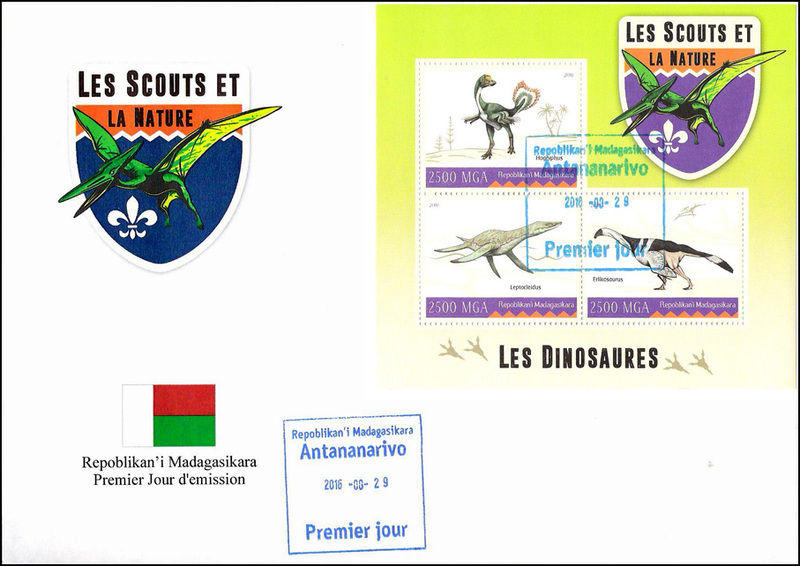 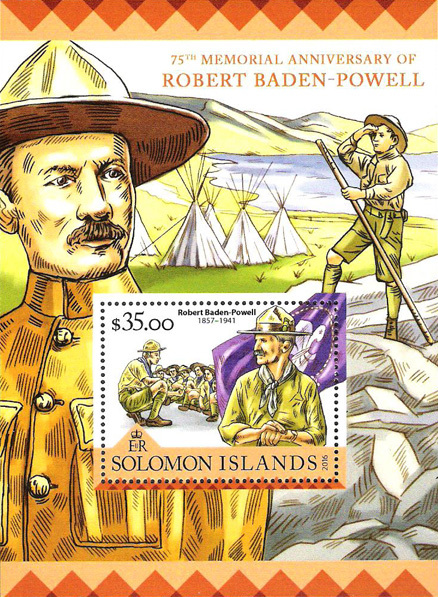 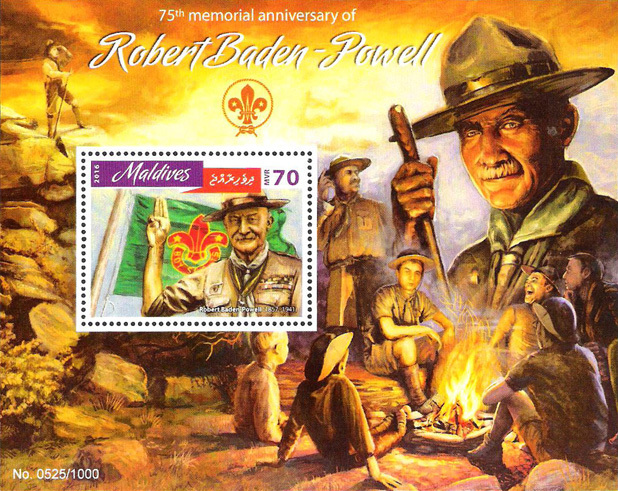 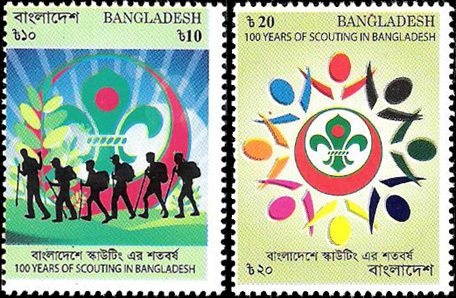 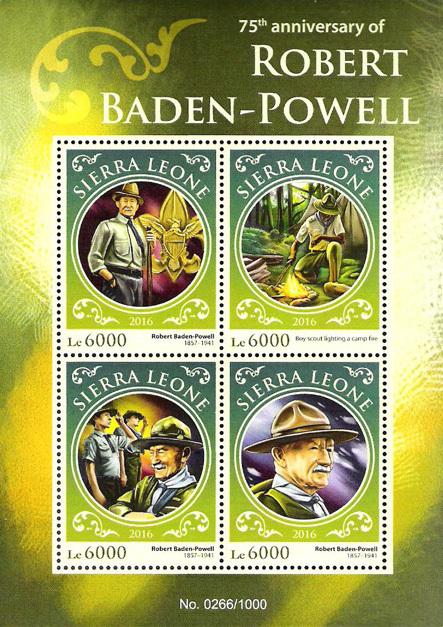 Stamp shows stylized Scouts against background of Bangladesh Scout logo. 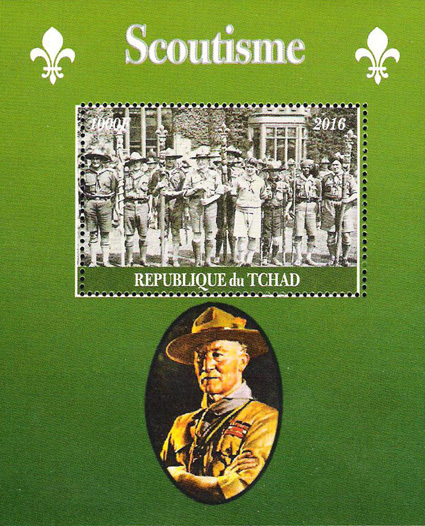 The 20 Tk. 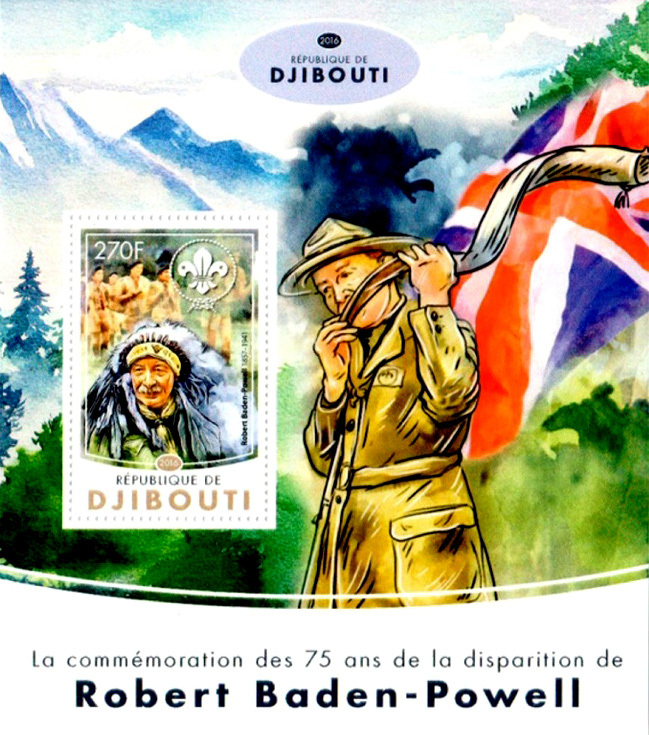 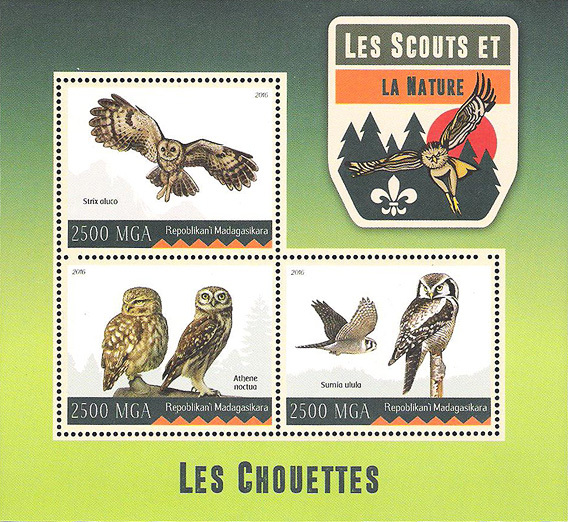 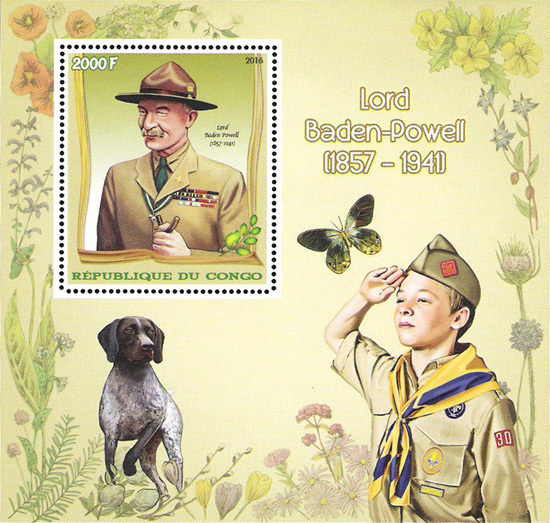 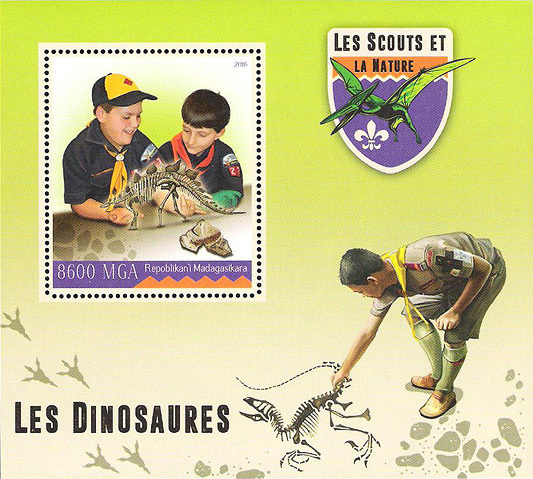 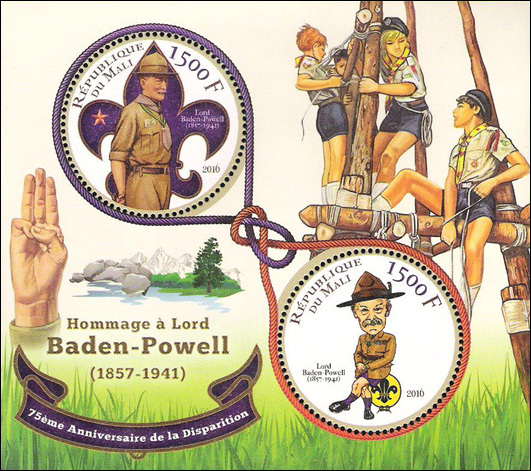 Stamp shows the Scout badge . 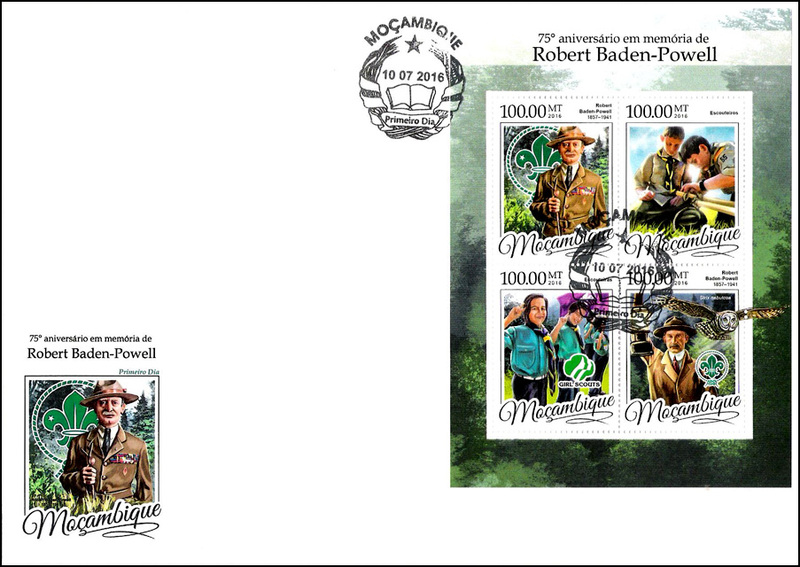 Designer: Sanjiv Kanti Das; 6,000,000 stamps printed in sheets of 100 by offset by The Security Printing Corporation (Bangladesh) Ltd., Gazipur. 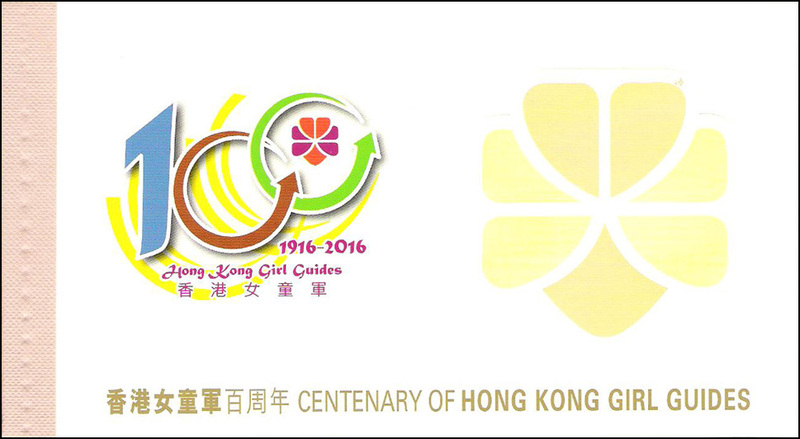 Set of 4 stamps and SS issued for the Centenary of the Hong Kong Girl Guides. 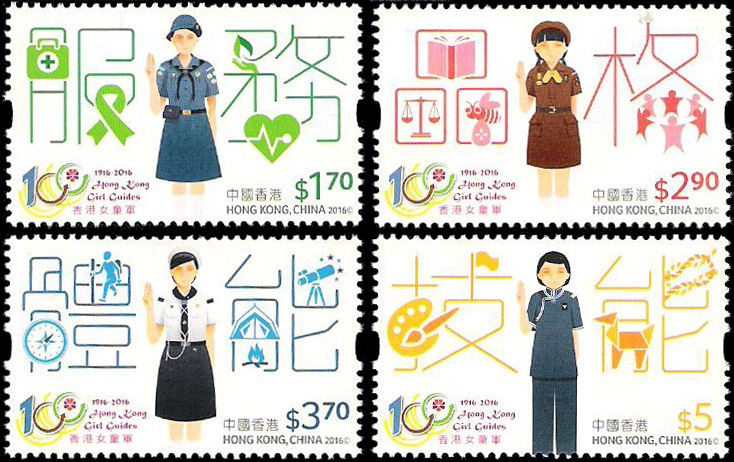 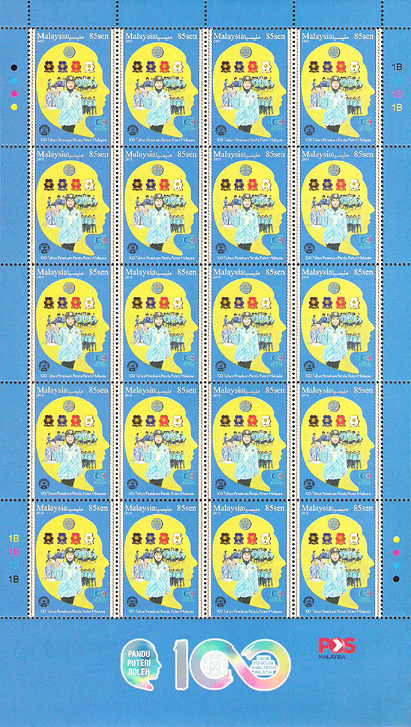 The $1.70 stamp highlights the current Girl Guide uniform and service; the $2.90 stamp the Brownies uniform of the 1970s and character; the $3.70 stamp the Sea Rangers' uniform from the 1940s to 1970s and fitness; the $5 stamp the Chinese Brownies uniform from 1920s and 1930s and skill. 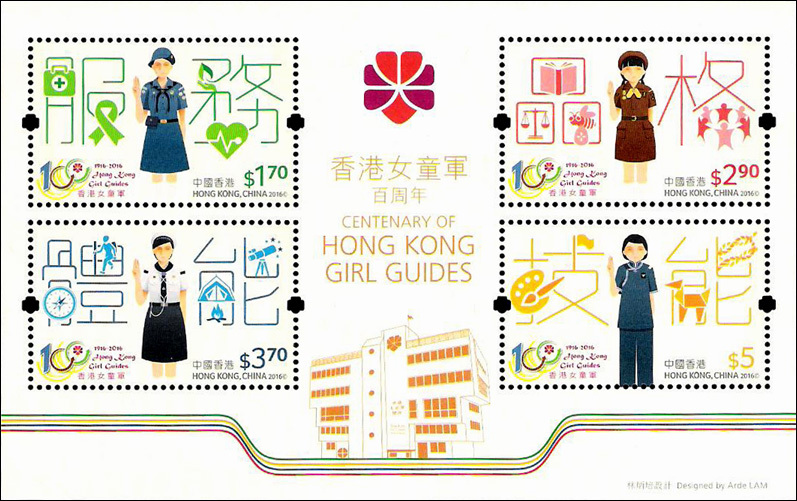 The stamps are repeated on the SS along with emblem of the Hon Kong Girl Guides Association. 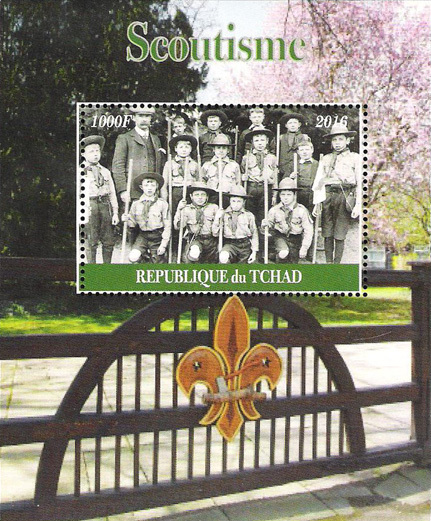 Printed by Cartor Security printing France. 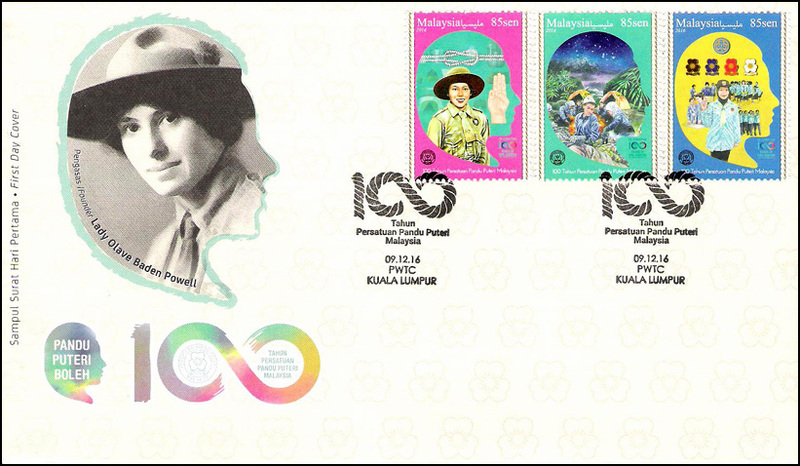 Set of 3 stamps for 100th anniversary of Girl Guides in Malaysia as the first Girl Guide unit was started in 1916 at Methodist Girls' School, Kuala Lumpur. 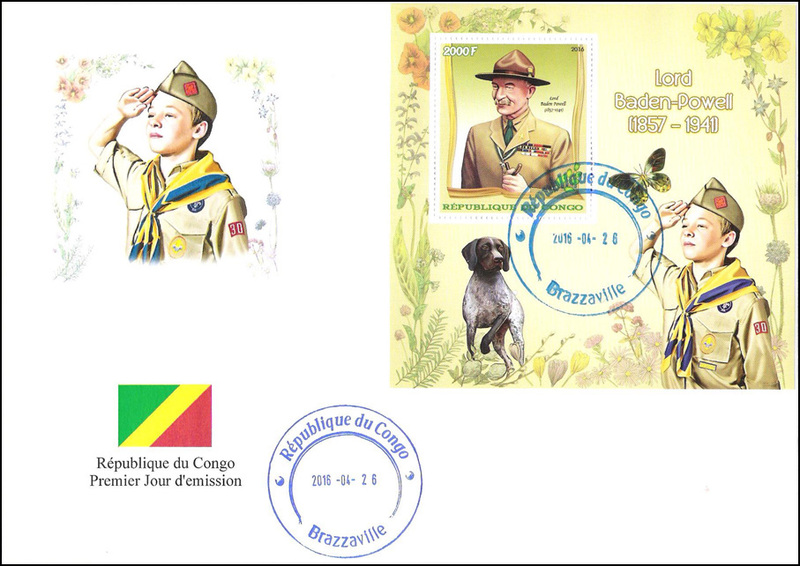 One stamp features Girl Guide in early uniform along with reef knot and Scout salute. 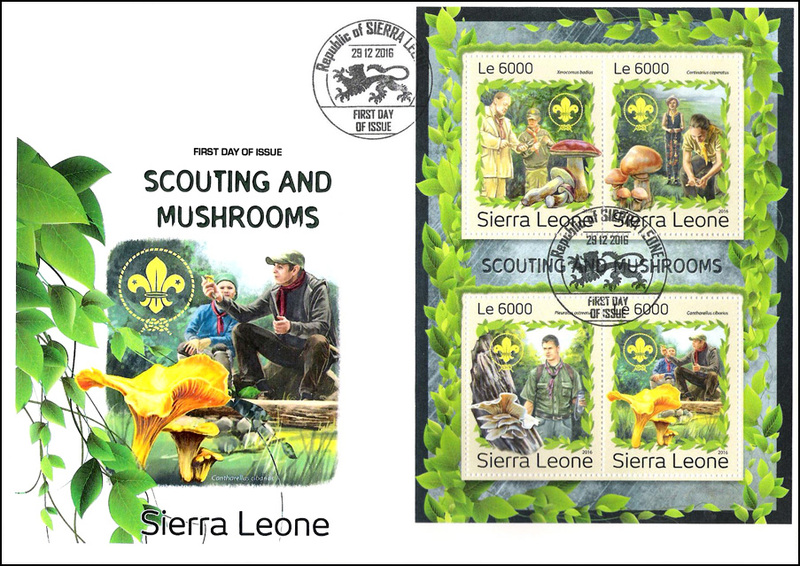 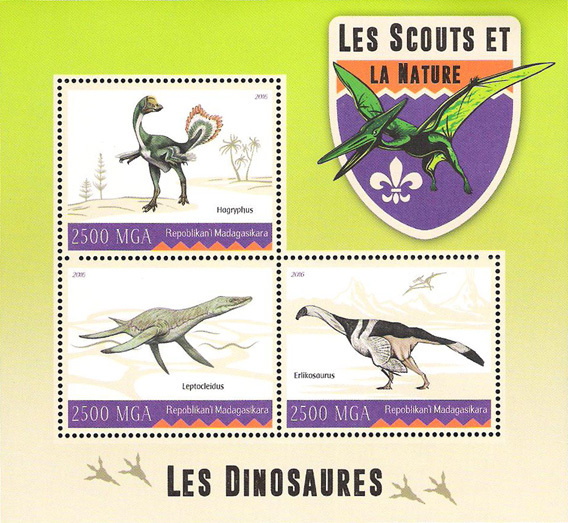 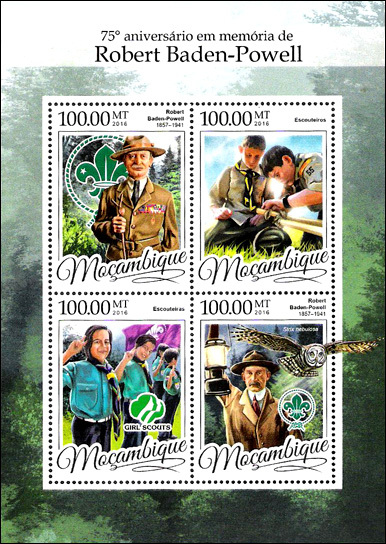 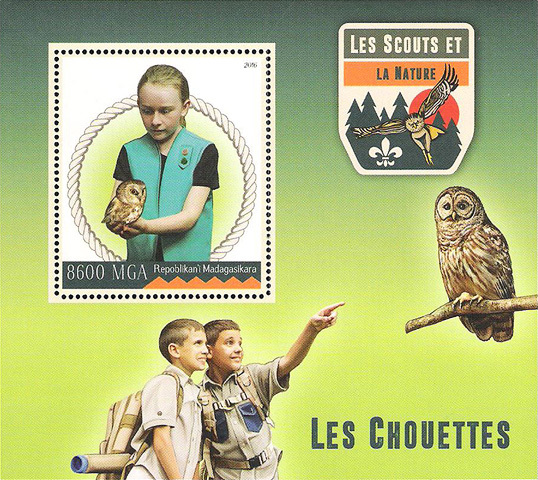 A second stamp features Girl Guides in attire for outdoor activities. 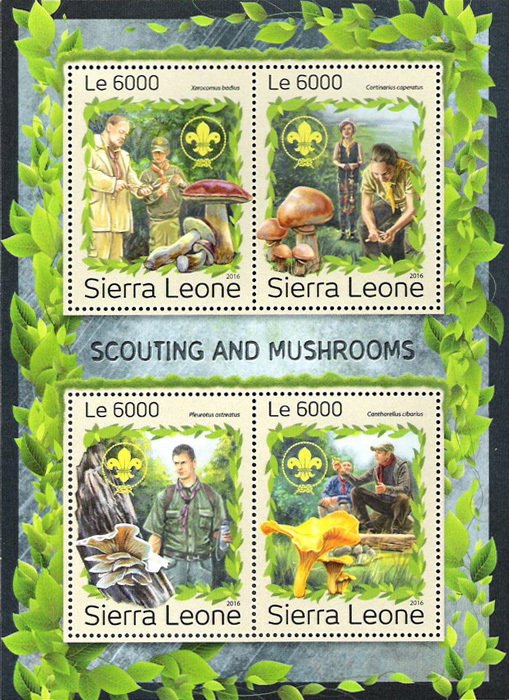 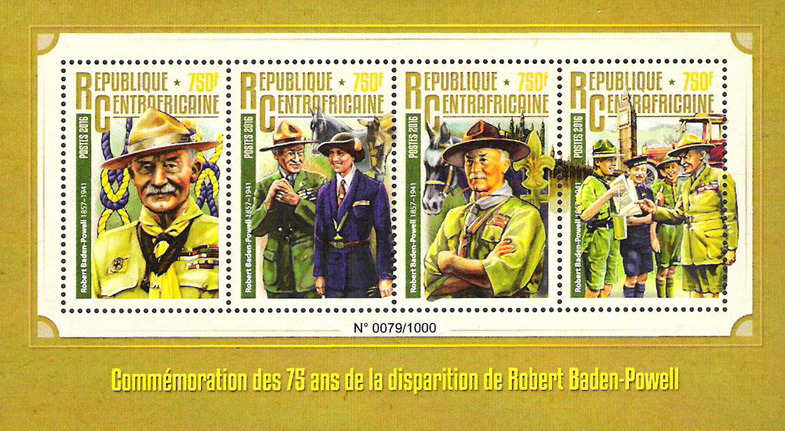 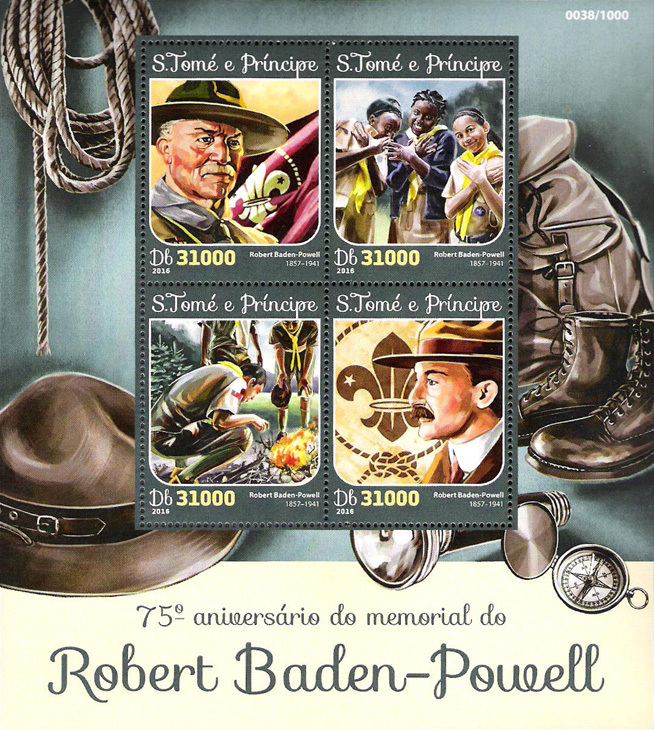 The third stamp shows the complete uniform with some badges and Guides and leaders in background. 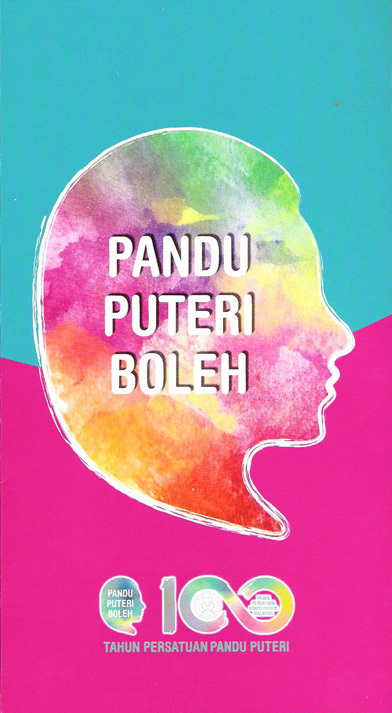 Designer: Ms. Nur Farhana Bakerrudin. 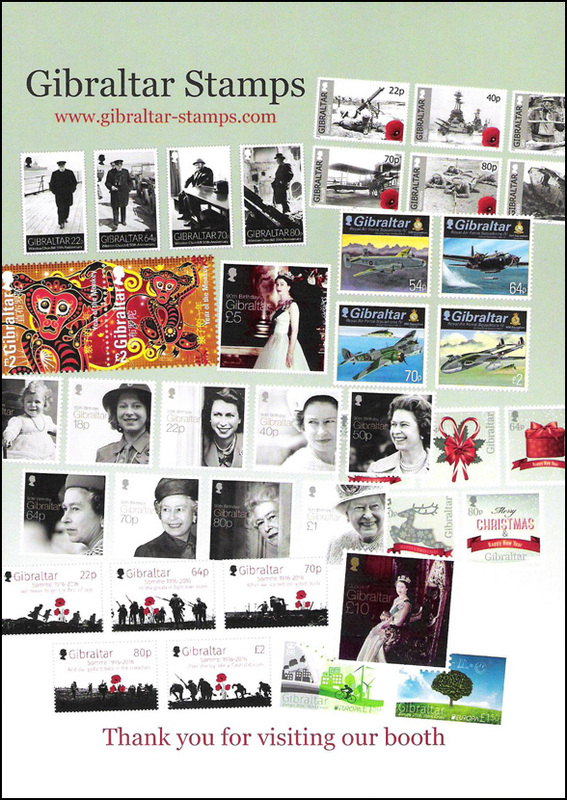 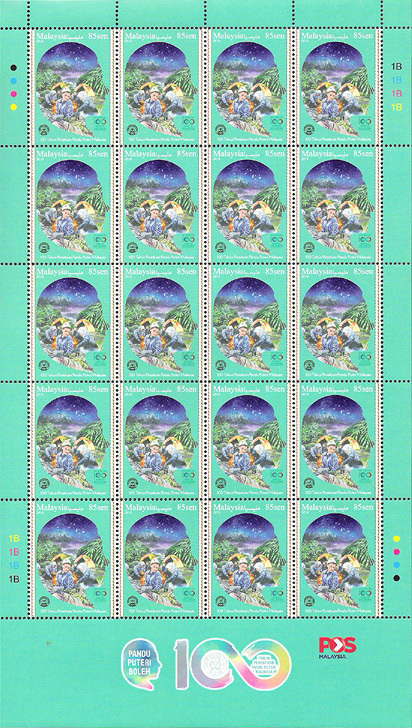 Value of each stamp - 85 sen.
150,000 sets printed by Southern Colour Print New Zealand. 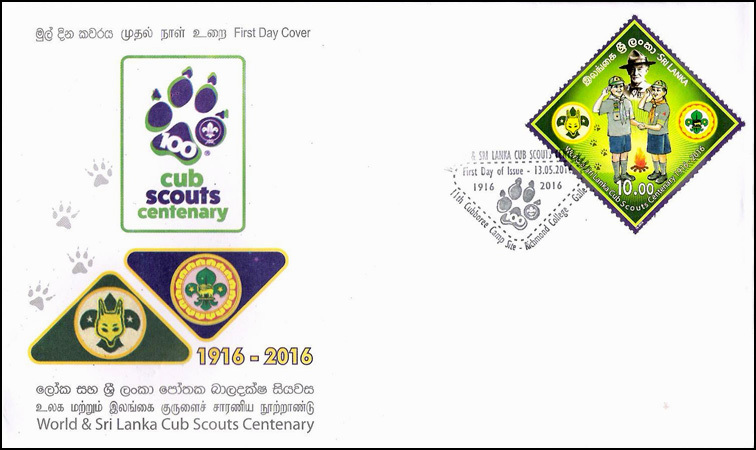 Single stamp issued in sheets of 20 for the Centenary of both world and Sri Lanka Cub Scouts. 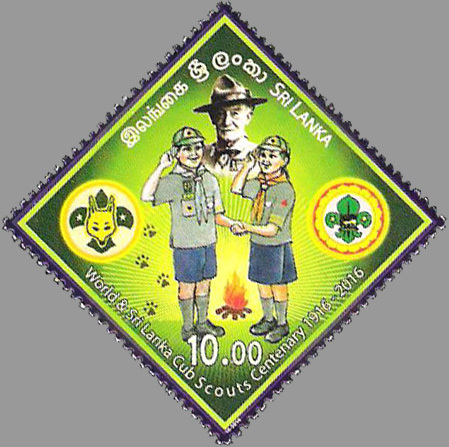 Wolf Cubs in Sri Lanka started by Scout troop at Richmond College Galle. 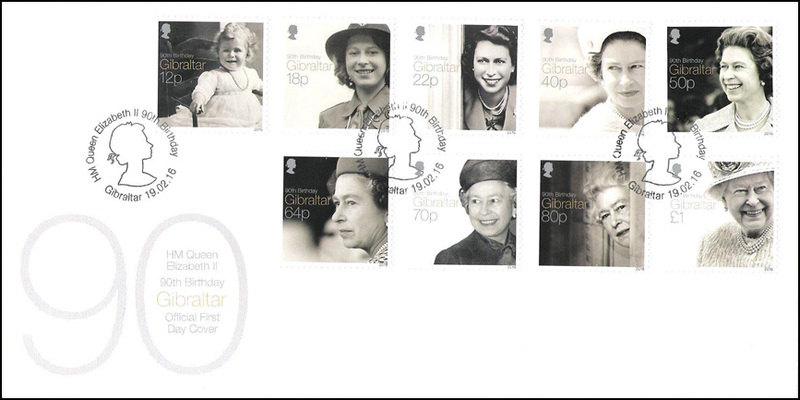 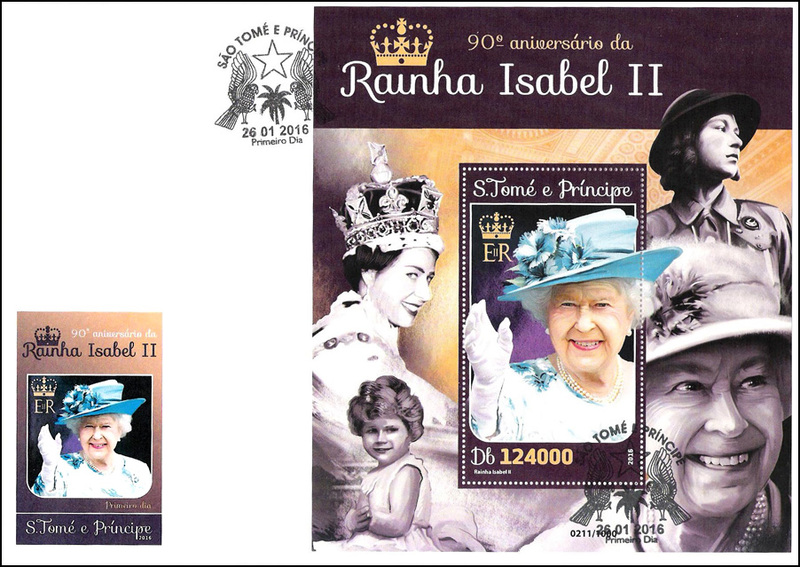 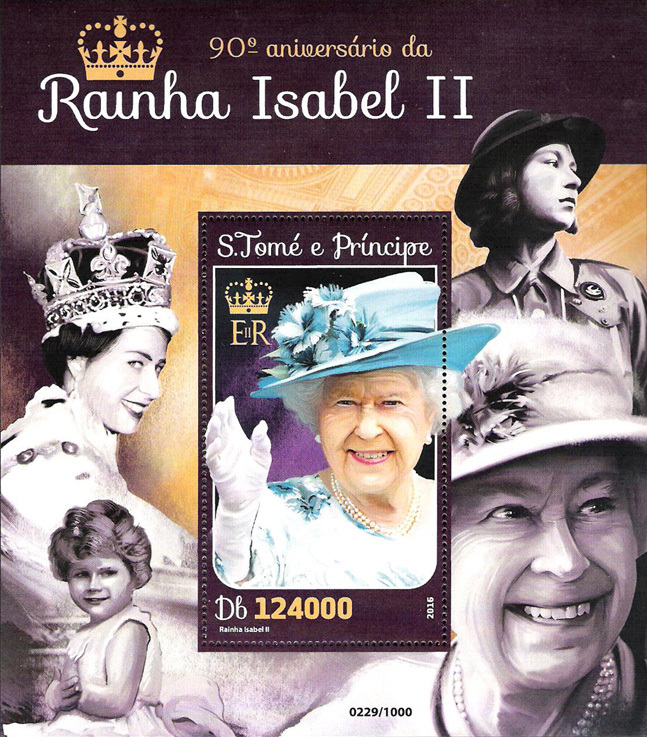 SS (perf & imperf) for the Queen's 90th birthday with stamp showing an official portrait for her birthday. 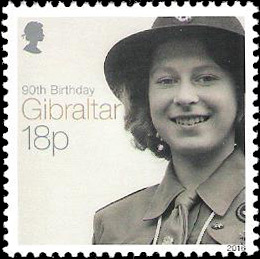 Included in the images in the selvage is a view of Princess Elizabeth in Girl Guide uniform in WWII. 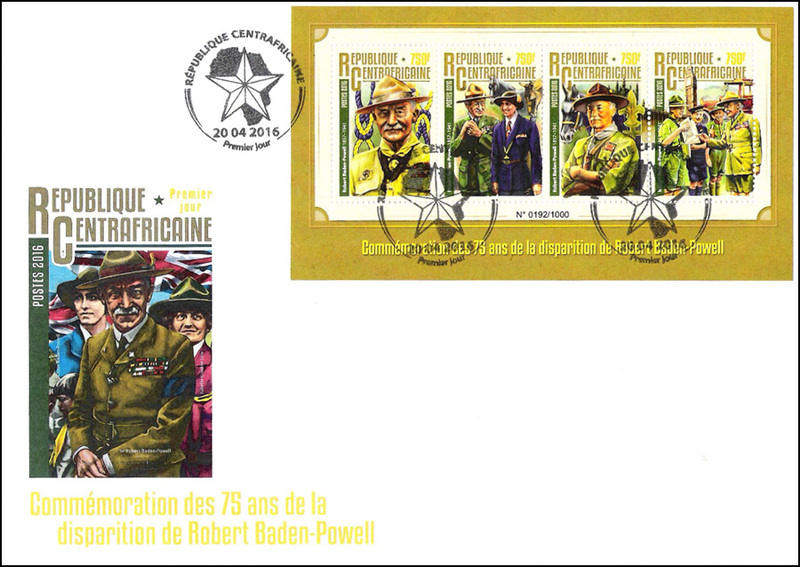 MS of 4 and SS (perf & imperf) commemorating the 75th anniversary of his death on 8 January 1941. 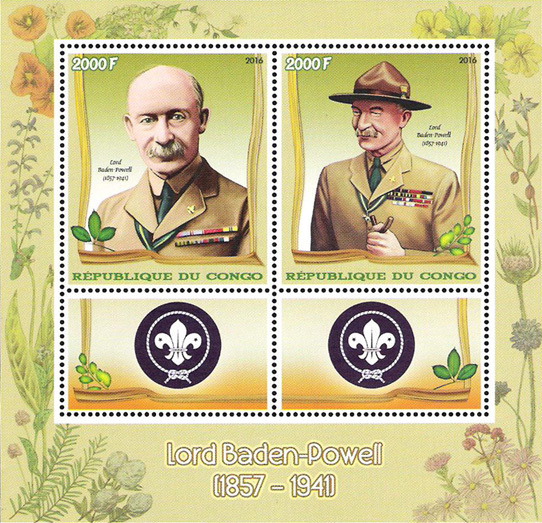 Two stamps in MS show B-P, one is with Lady B-P and one stamp showing B-P with leaders including William Hillcourt "Green Bar Bill" on the left. 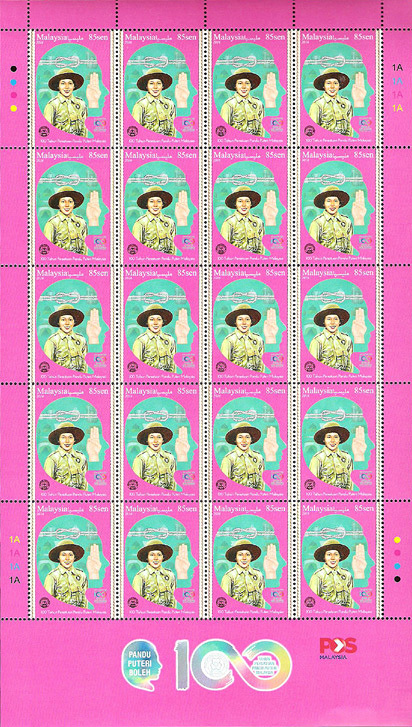 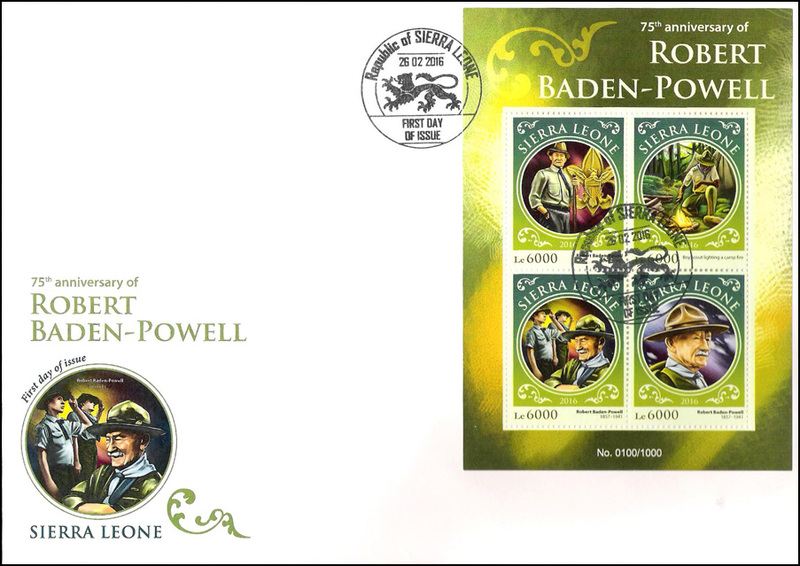 Stamp in SS shows B-P with Scouts and Lady B-P and Juliette Gordon Low in selvage. 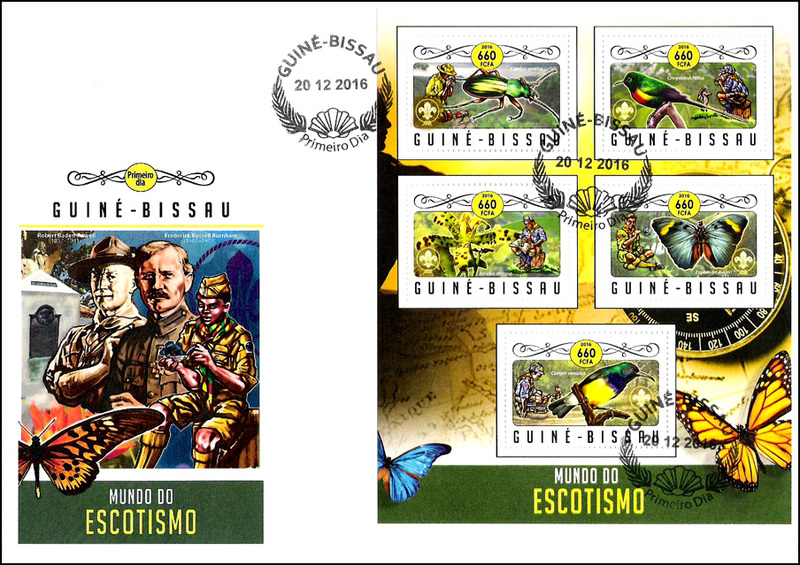 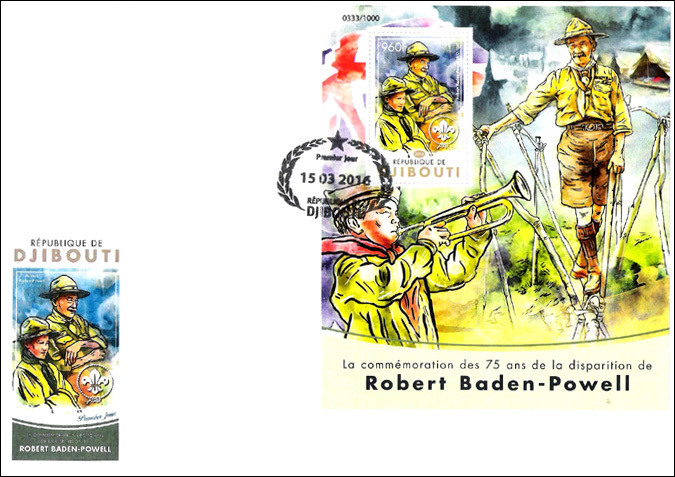 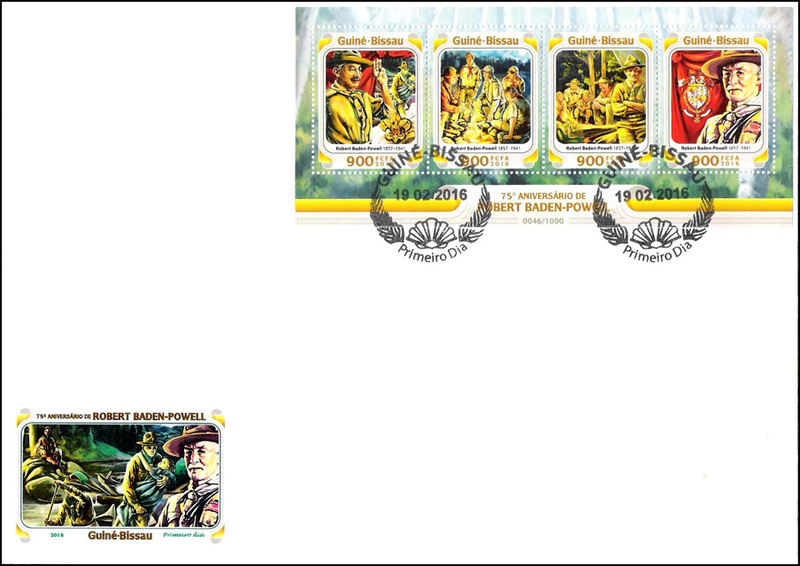 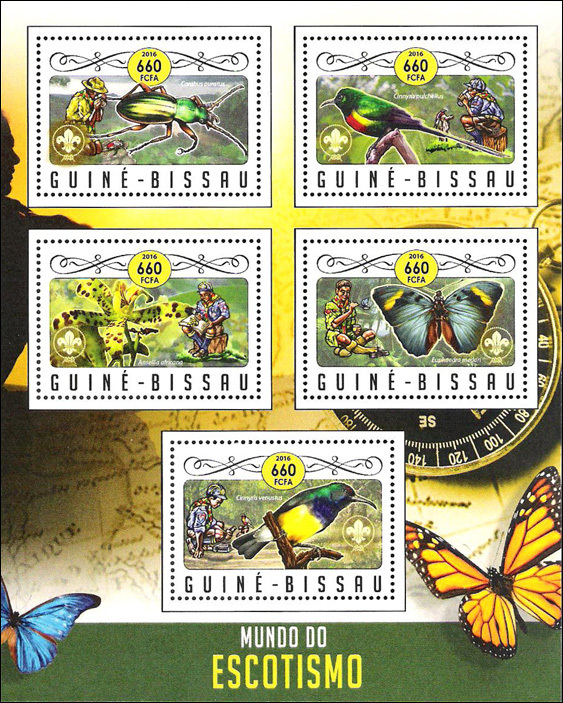 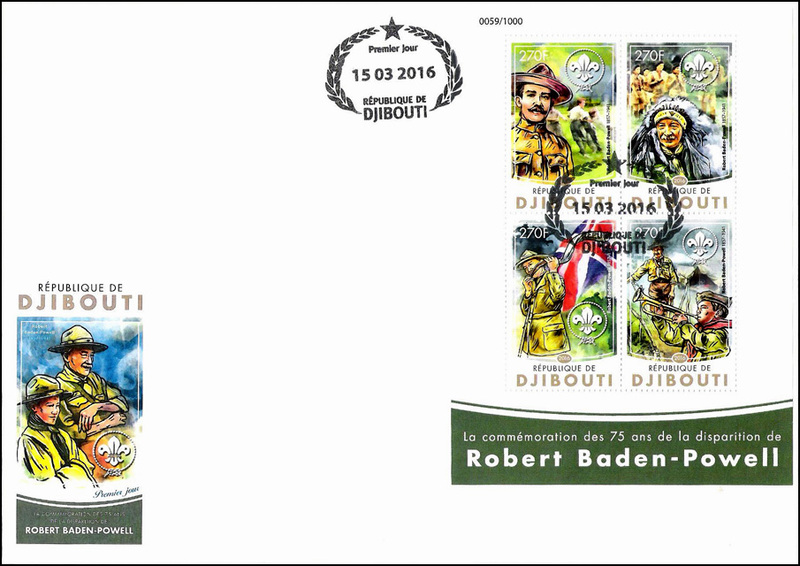 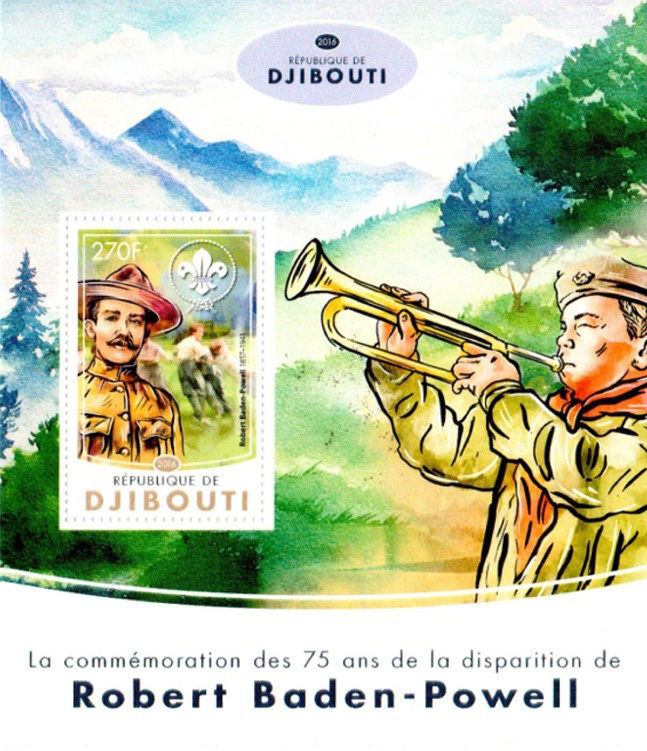 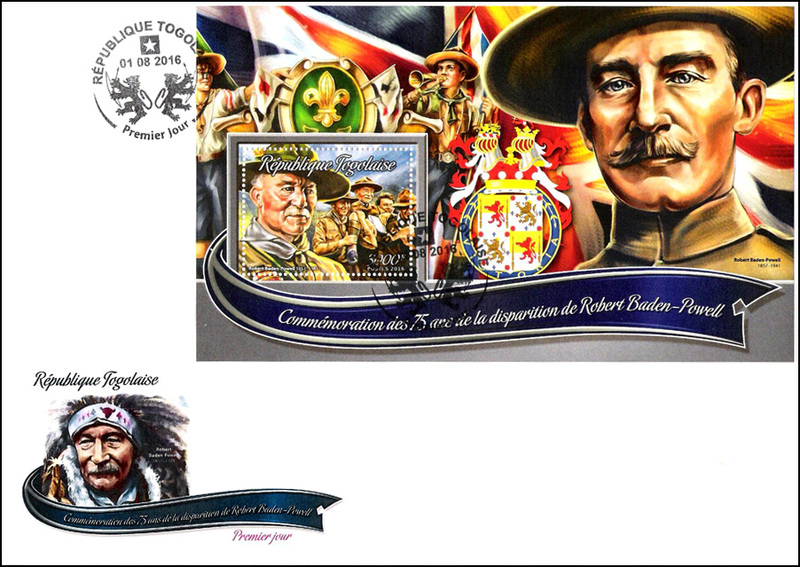 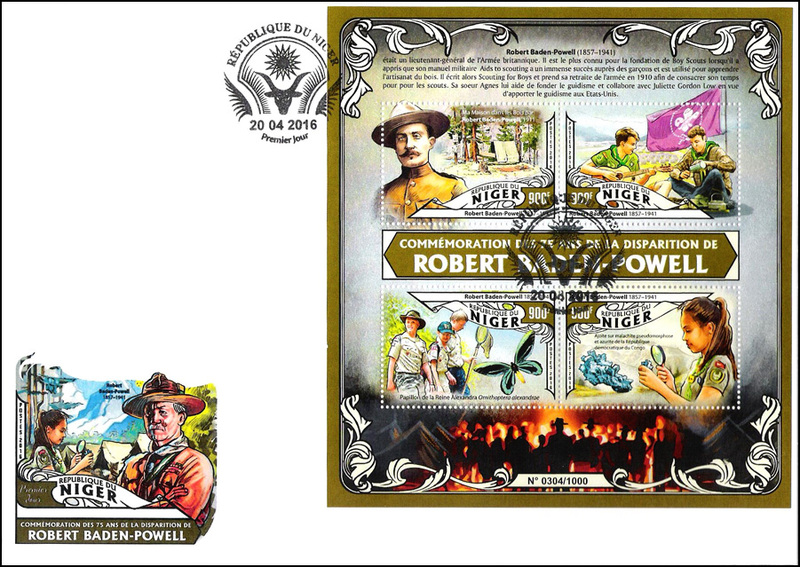 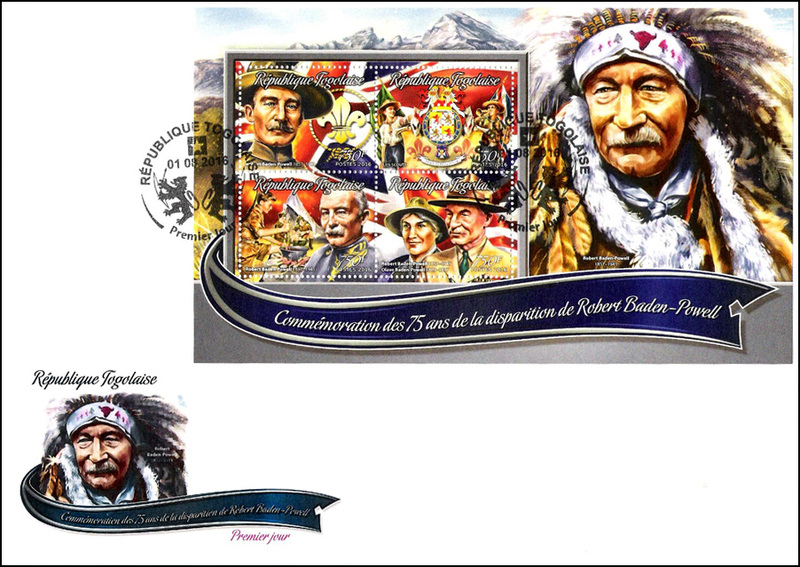 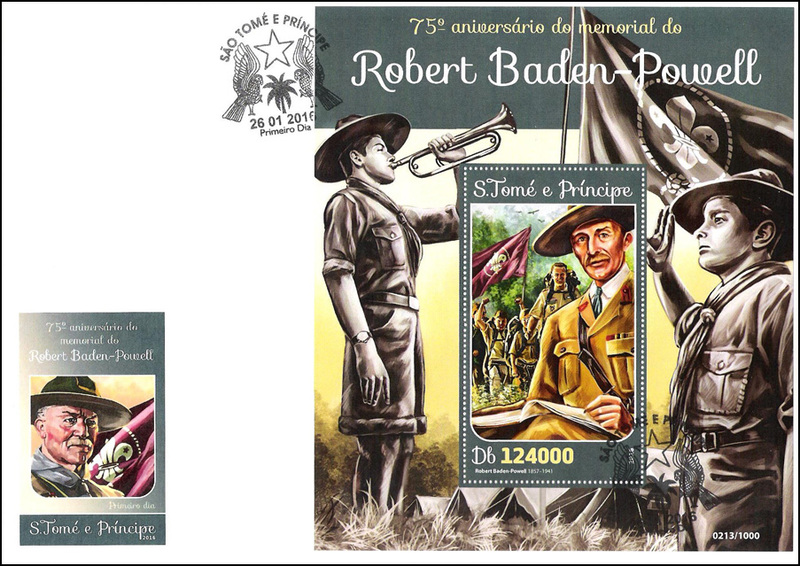 MS of 4 and SS (perf & imperf) and 4 deluxe SSs for the commemoration of the 75th anniversary of the death of B-P. Of the 4 stamps in MS, one depicts B-P in military, one blowing kudu horn, one with Scout bugler and one wearing an Indian headdress. 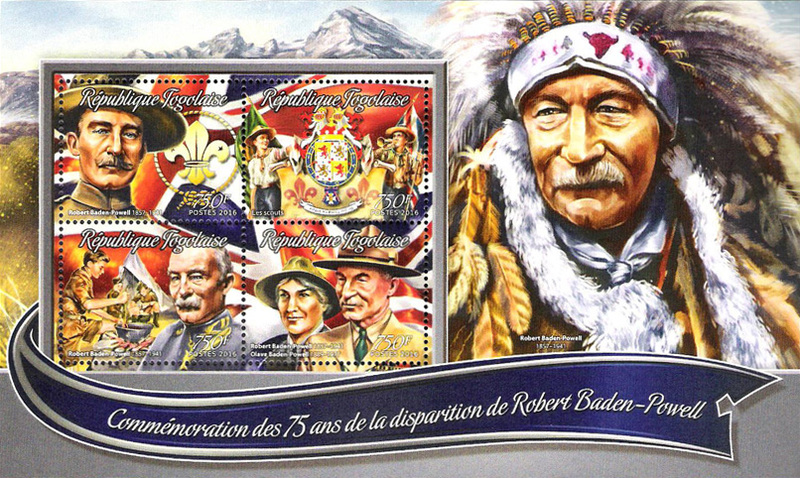 The United States contingent had presented B-P with an Indian headdress at the 1920 World Jamboree. 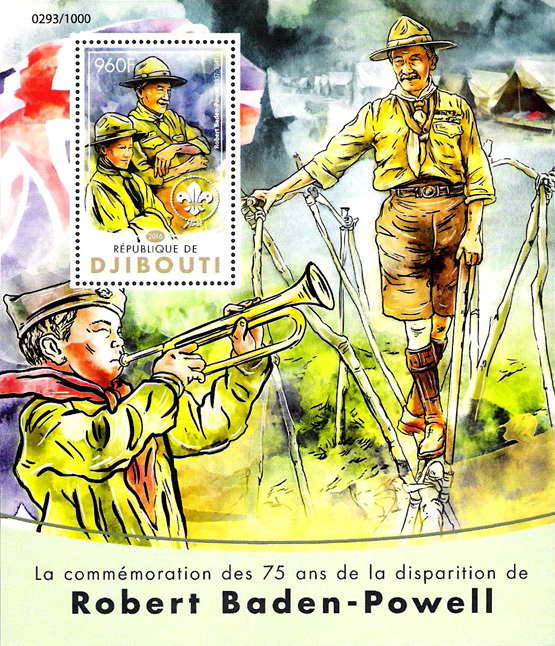 SS shows B-P on monkey bridge and a Scout bugler. 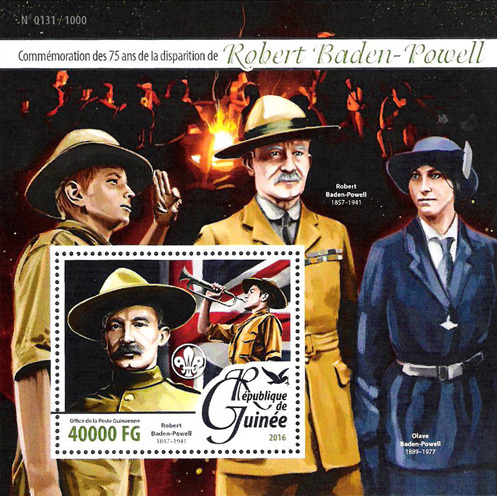 Stamp in SS depicts B-P in military uniform while he and Lady B-P are in selvage. 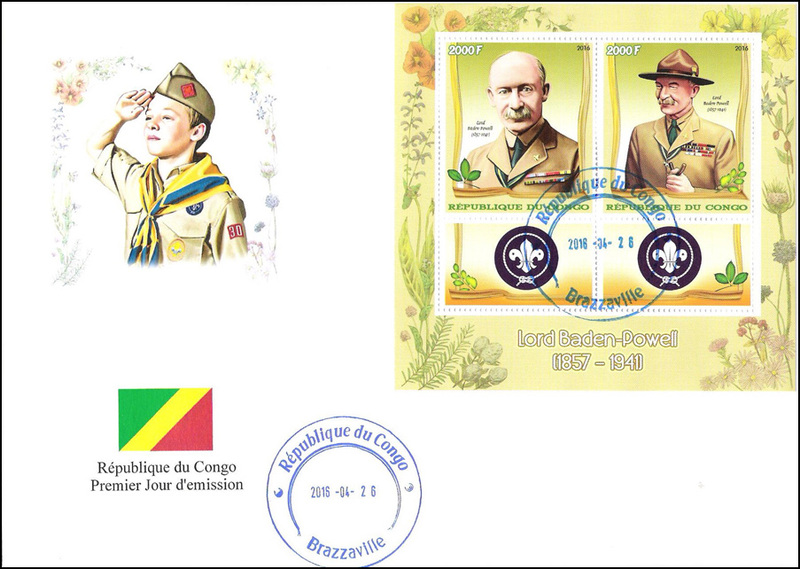 MS of 4 and SS (perf & imperf) issued for 75th anniversary of death of B-P. B-P is depicted on one stamp of MS and with Scouts on others. 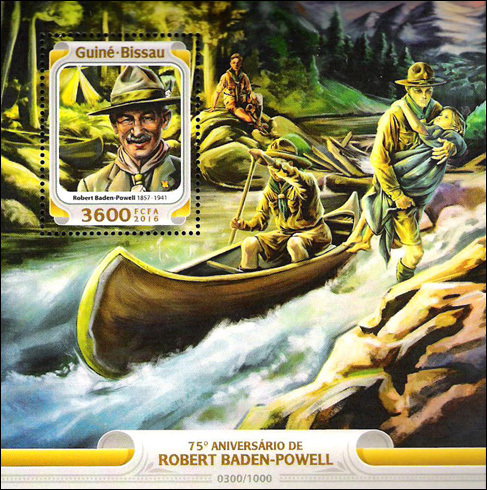 He is on SS with canoeists in selvage. 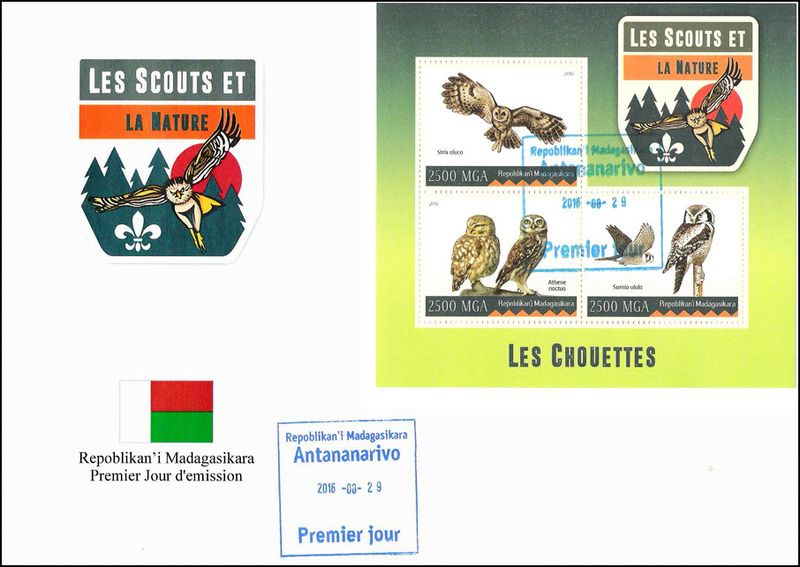 MS of 5 and SS (perf & imperf). 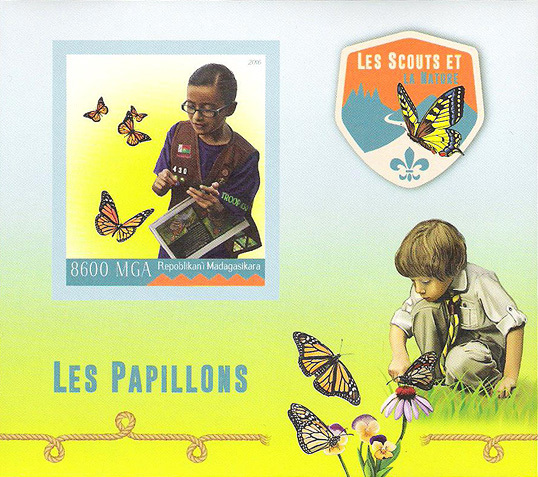 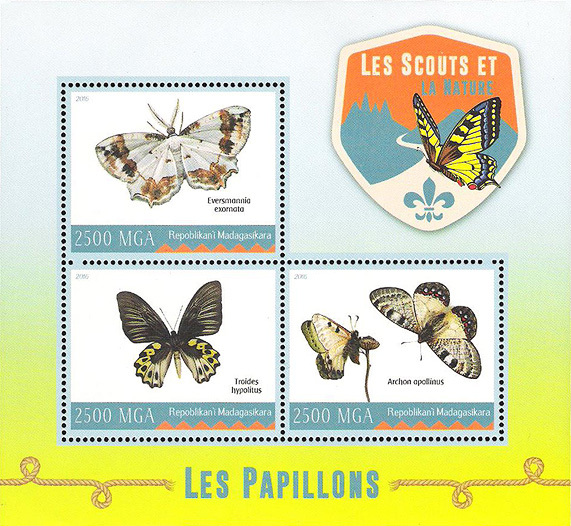 The MS features Scouts with birds, insects, butterflies and orchids. 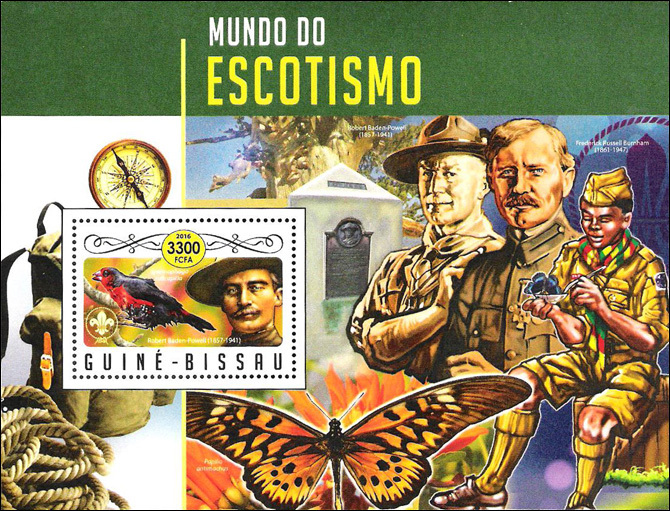 SS shows B-P with a bird while in selvage he is shown with Frederick Russell Burnham (1861 - 1947). 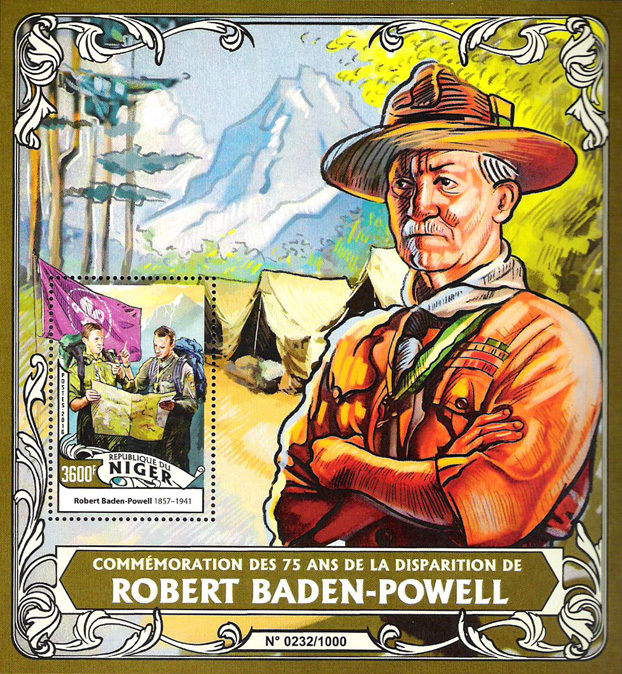 Burnham was an American scout and adventurer. 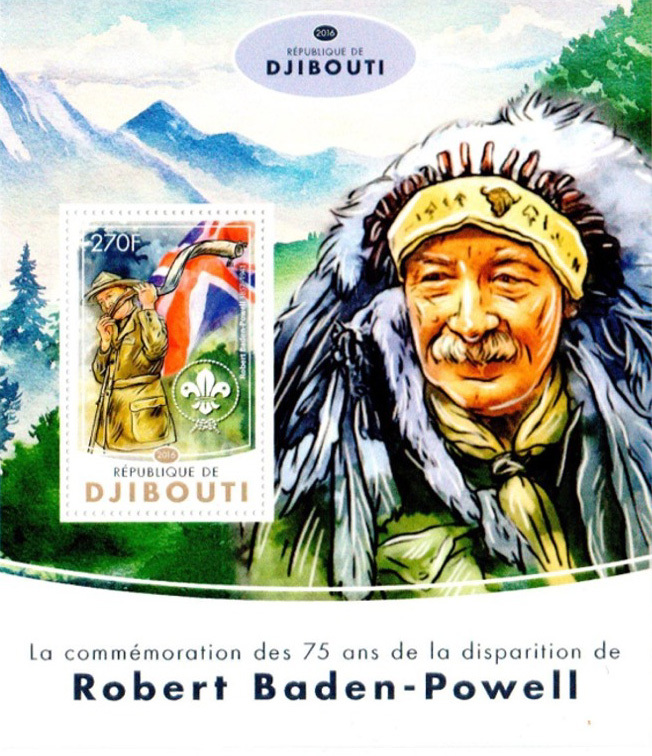 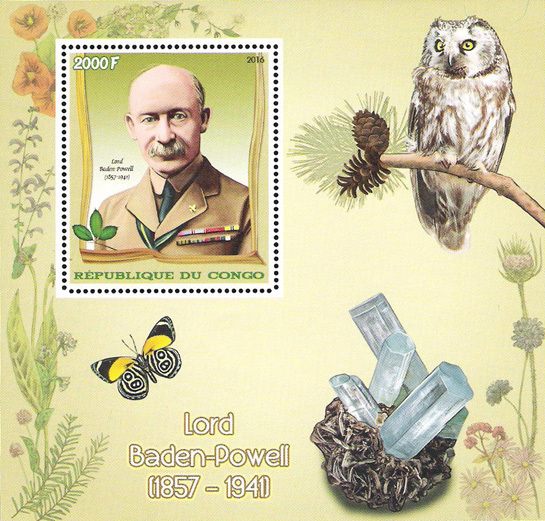 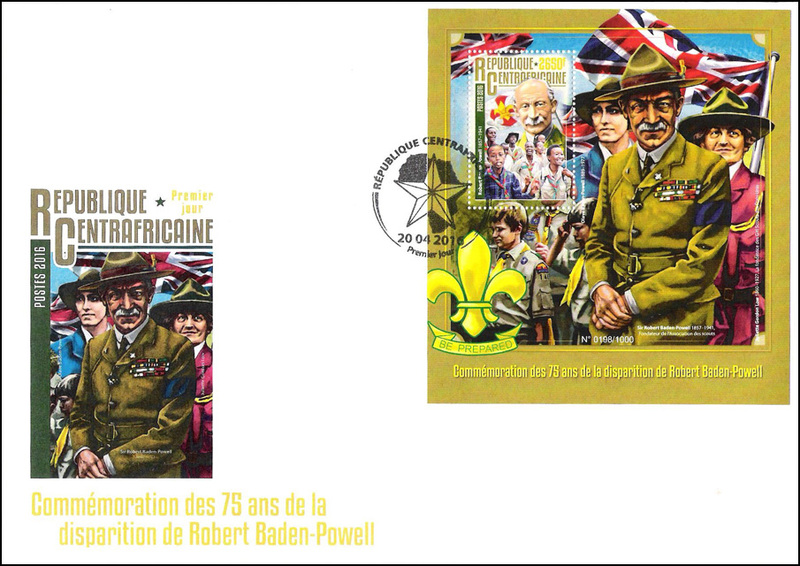 He later served with British Army in South Africa in 1890s and taught woodcraft to Baden-Powell. 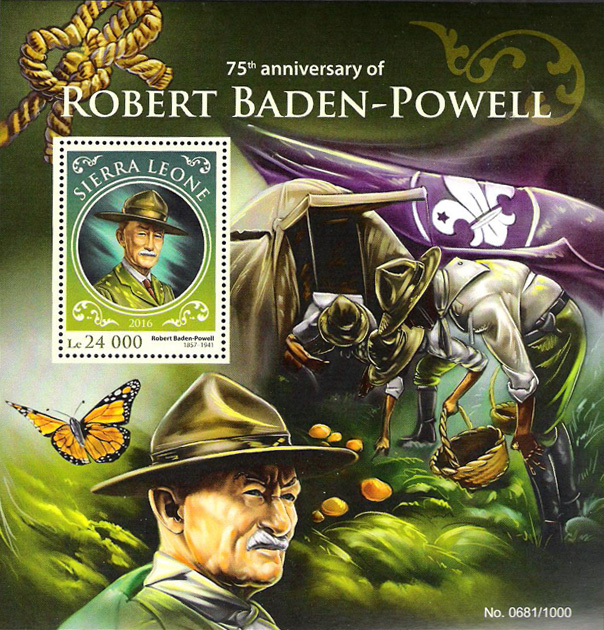 He returned to USA and was a leader in Boy Scouts of America receiving the Silver Buffalo Award. 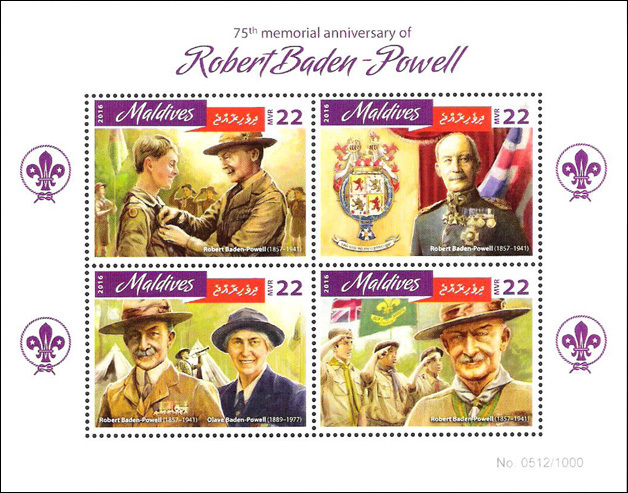 MS of 2 and SS (perf & imperf) for 75th anniversary of B-P's death. 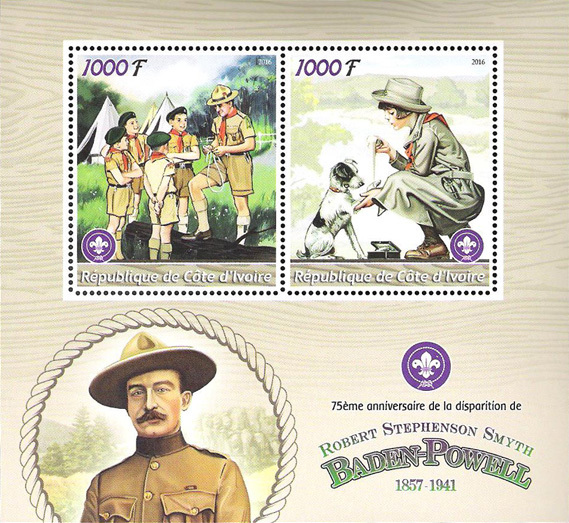 One stamp in MS shows Scouts learning knot tying and second stamp shows Girl Guide administering first aid to a dog. 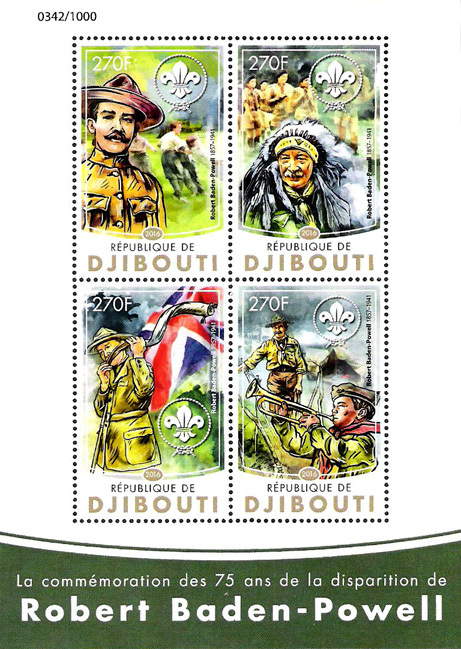 B-P in military uniform is in selvage. 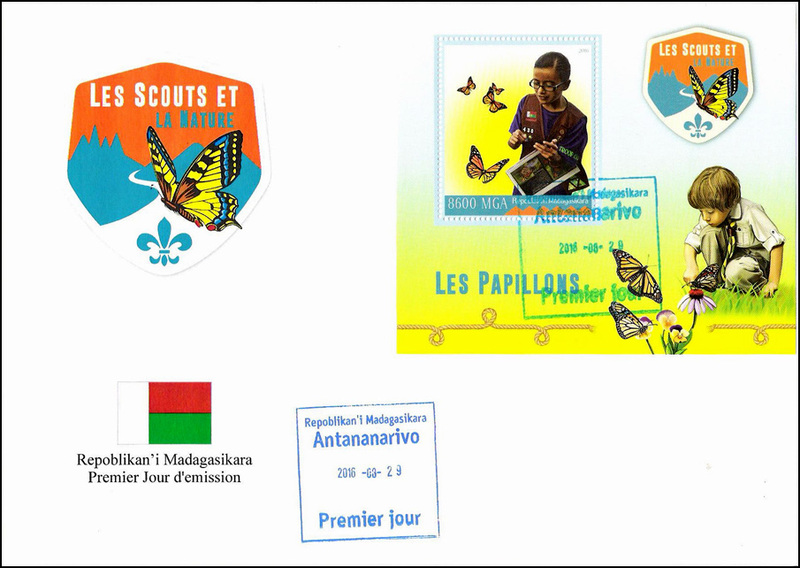 B-P is in triangular stamp in SS with Scout activities in selvage. 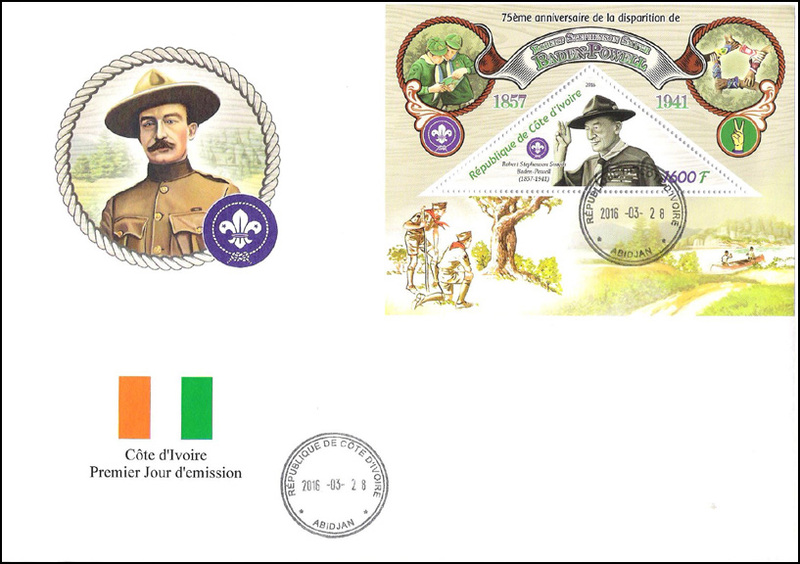 World Scout badge is on stamps and selvage of MS and SS. 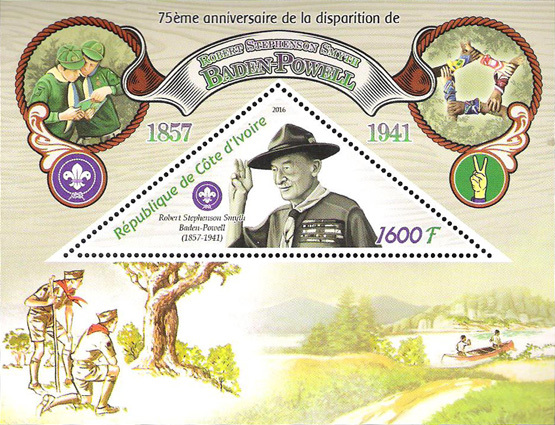 MS of 4 and SS (perf & imperf) for the 75th anniversary of the death of B-P. 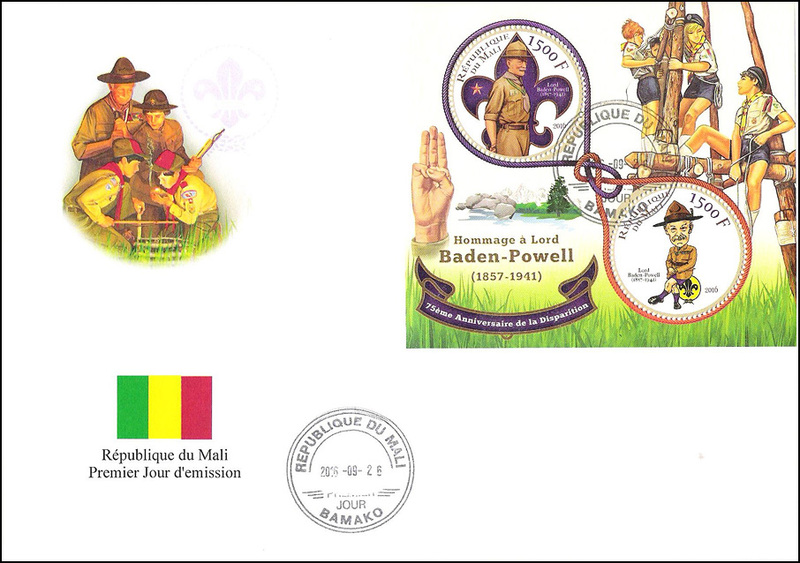 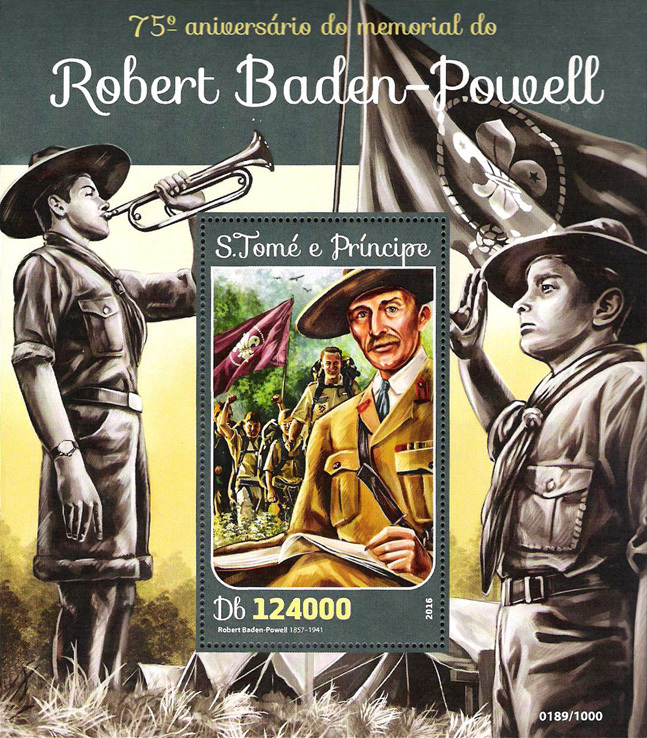 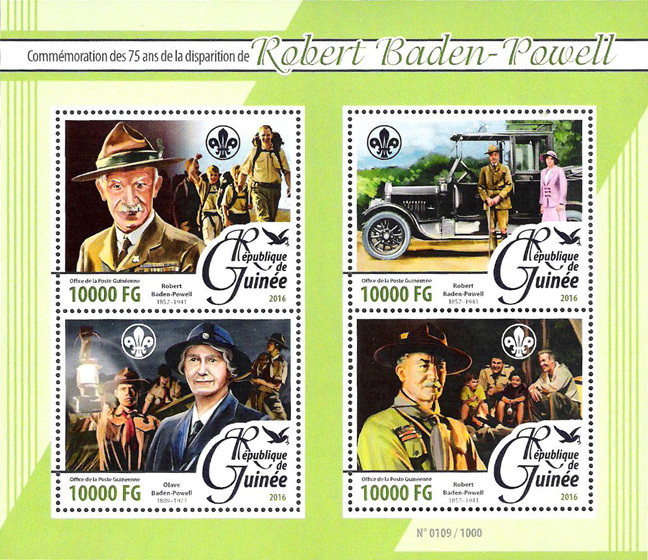 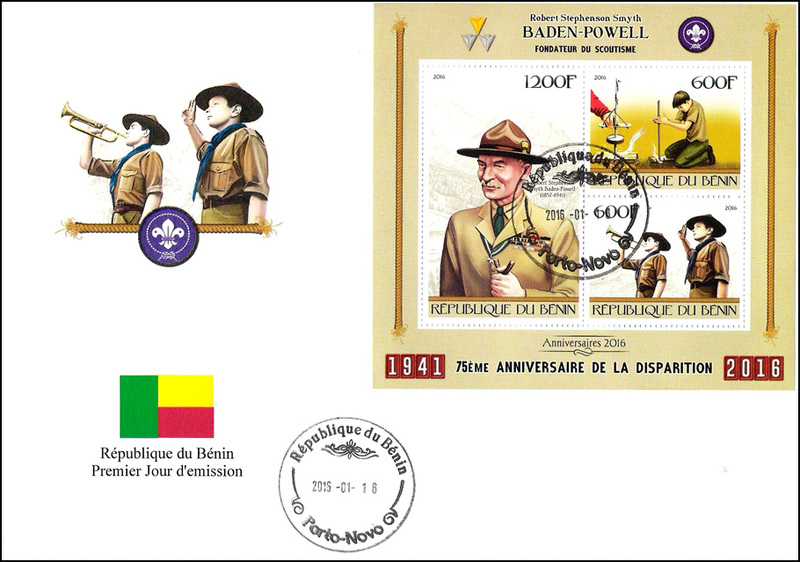 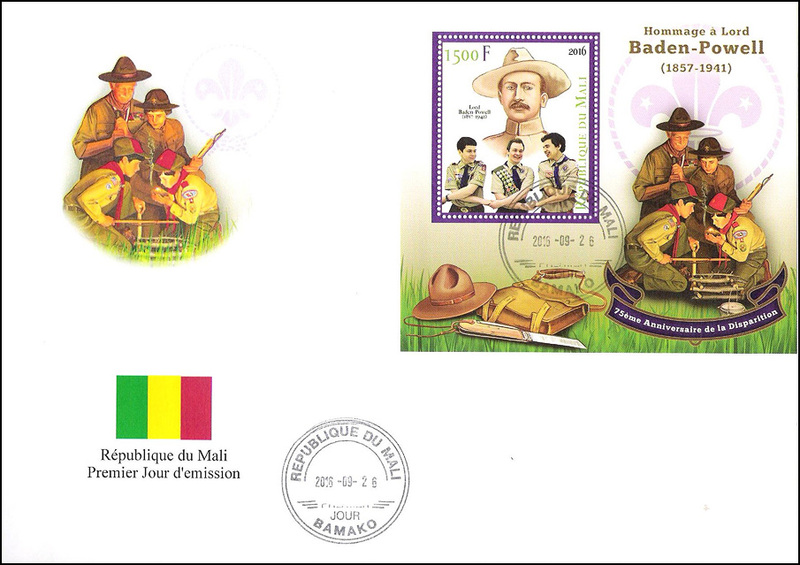 Images shown on MS are B -P awarding a Scout, B-P in general's uniform, B-P with Scouts and B-P and lady B-P. SS has B-P with Scout sign in stamp and B-P with stave and Scouts ar campfire in selvage. 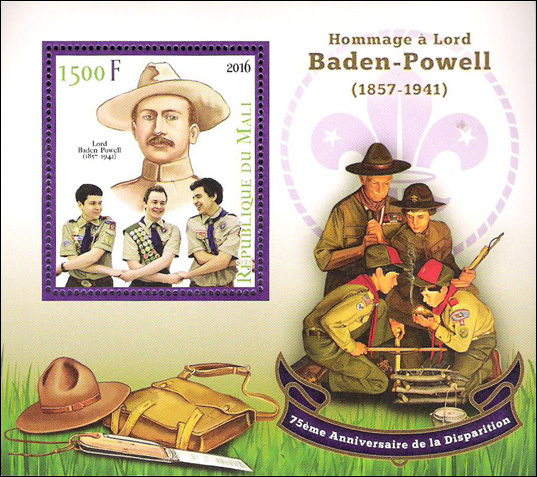 MS of 2 and SS (perf & imperf) paying homage to B-P on the 75th anniversary of his death. 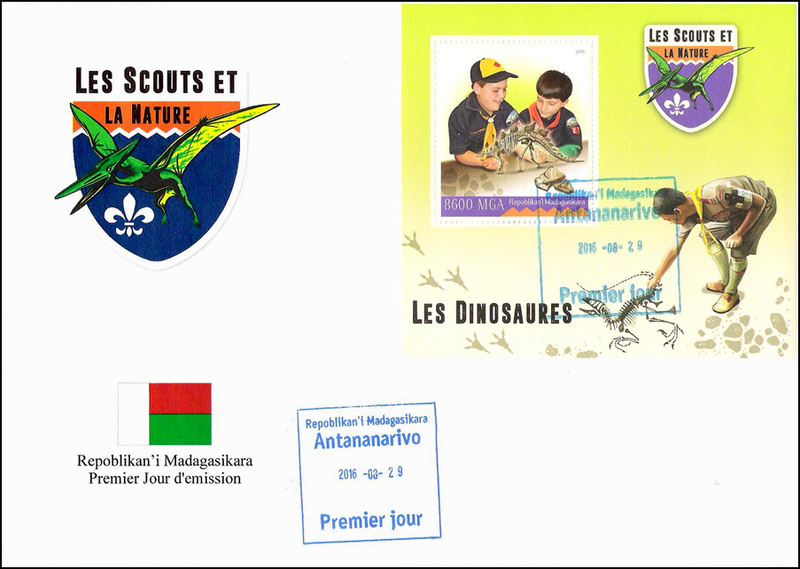 Two stamps in MS are circular and feature B-P. Selvage shows Scout sign and Scouts building a tower. 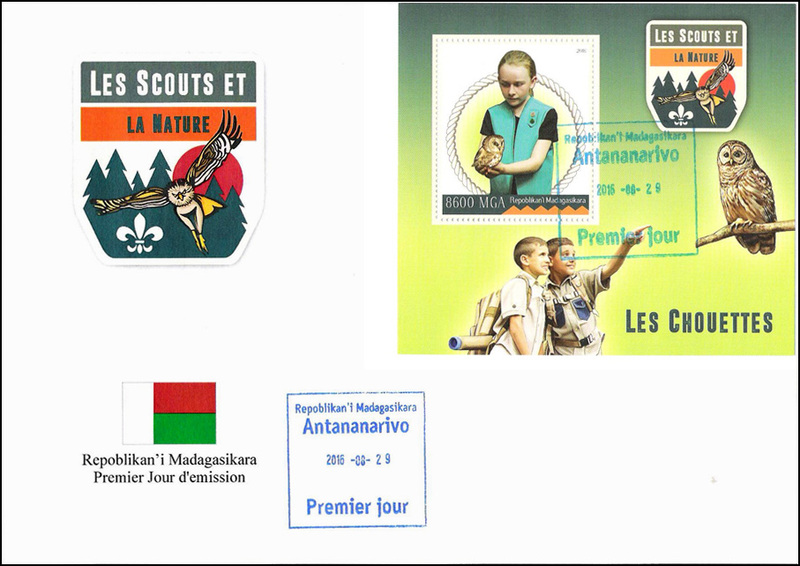 SS shows B-P with 3 American Scouts and Scouts and equipment in selvage. 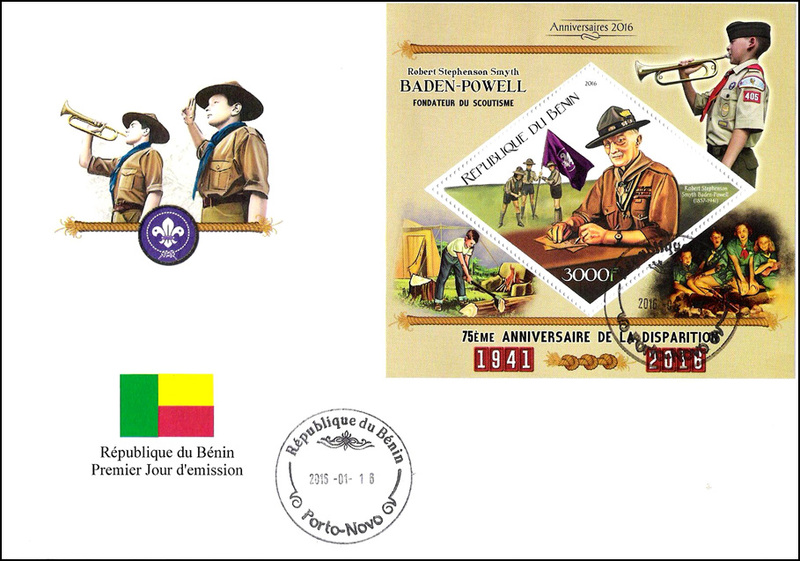 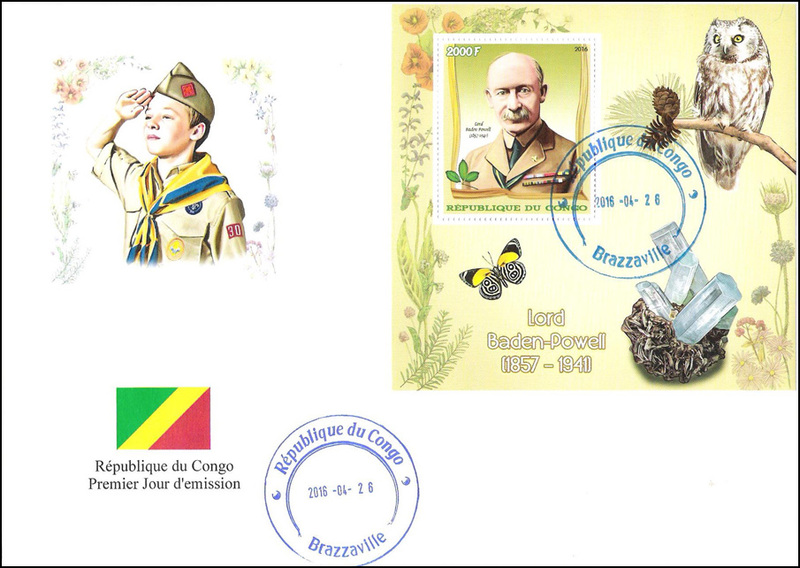 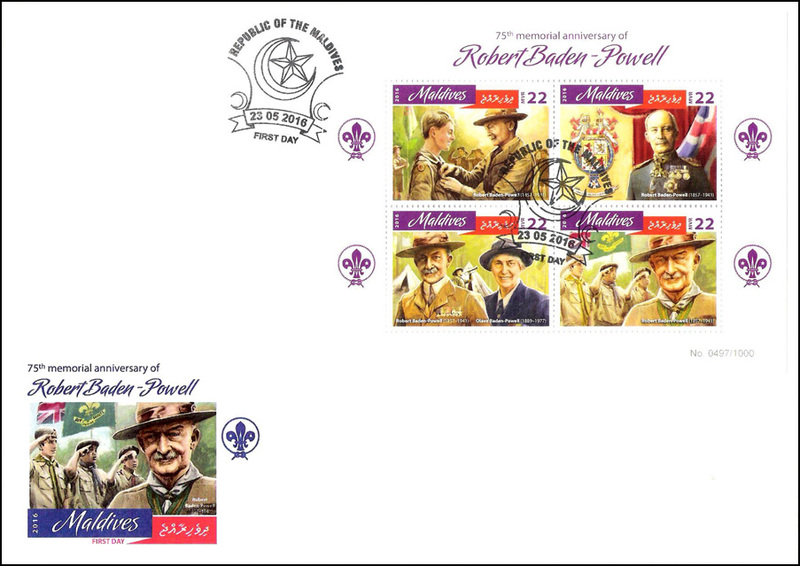 MS of 4 and SS (perf & imperf) for 75th anniversary of death of B-P. Two stamps in MS show B-P with World Scout badge while the other two show Scout activities. 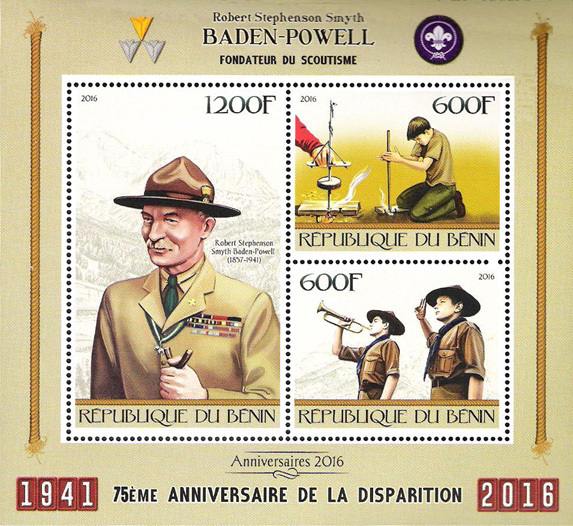 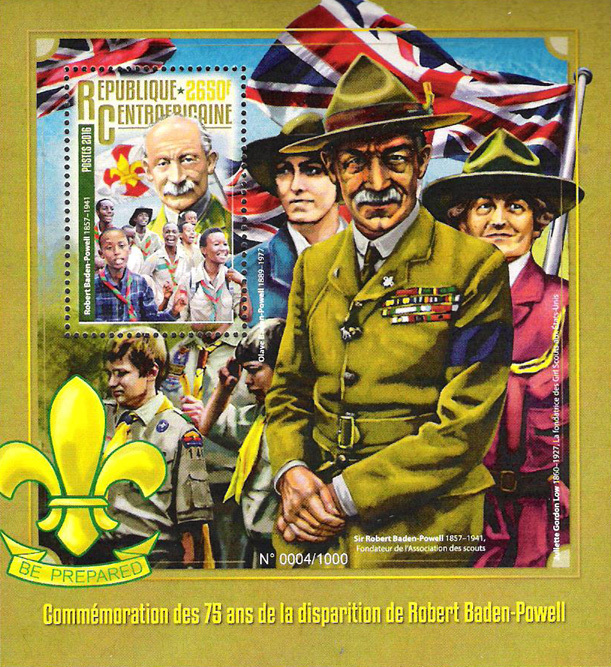 Stamp in SS depicts B-P and Scouts with World Scout flag. 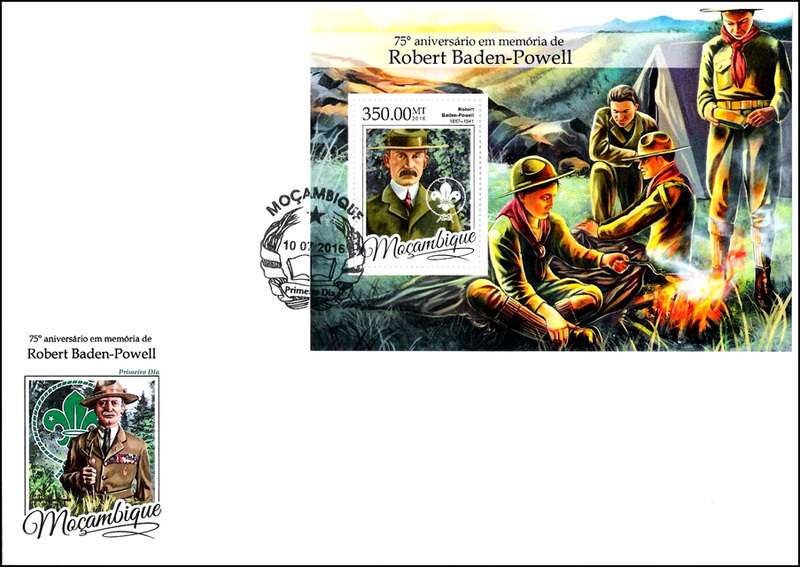 Bugler and Scout with Scout sign are in selvage. 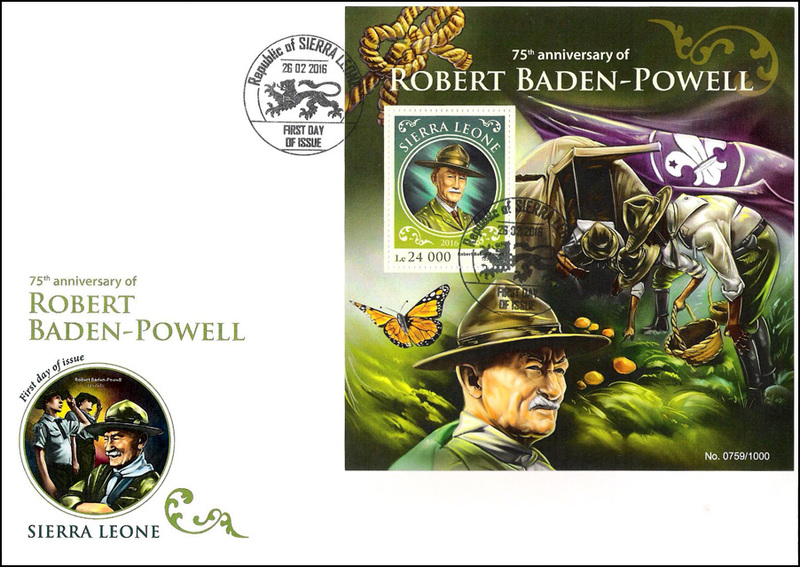 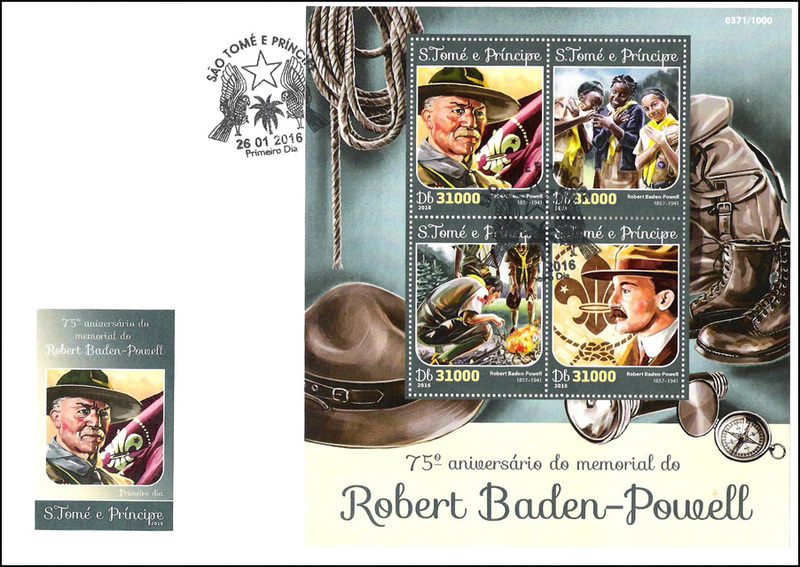 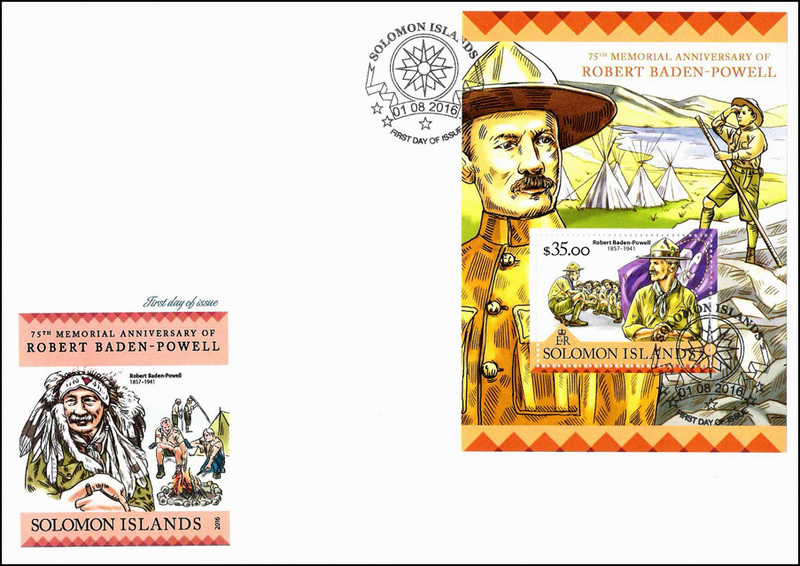 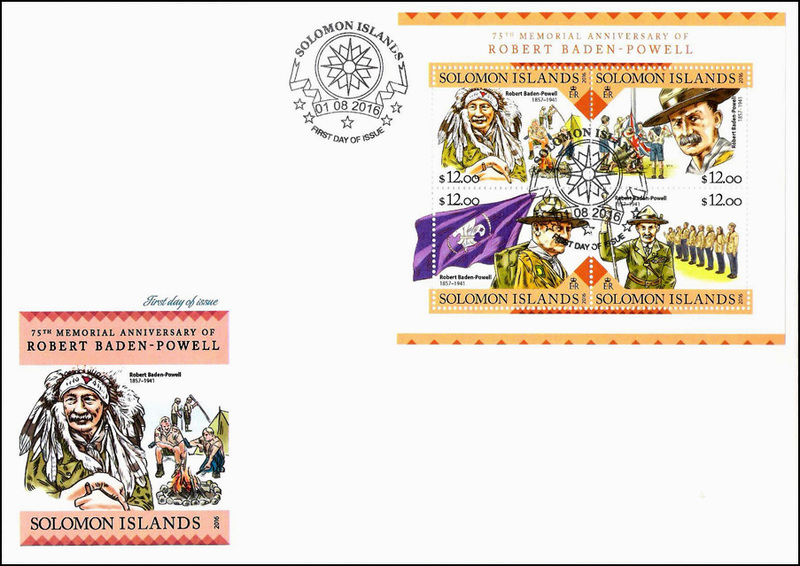 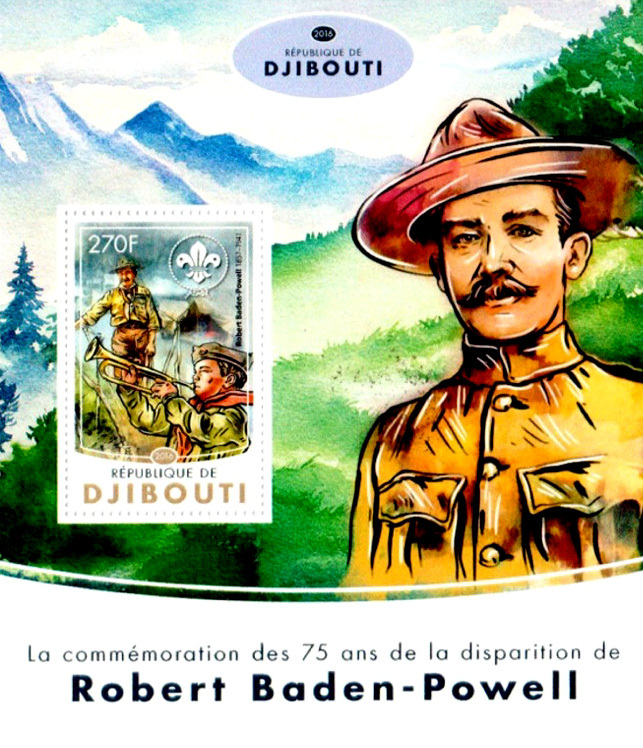 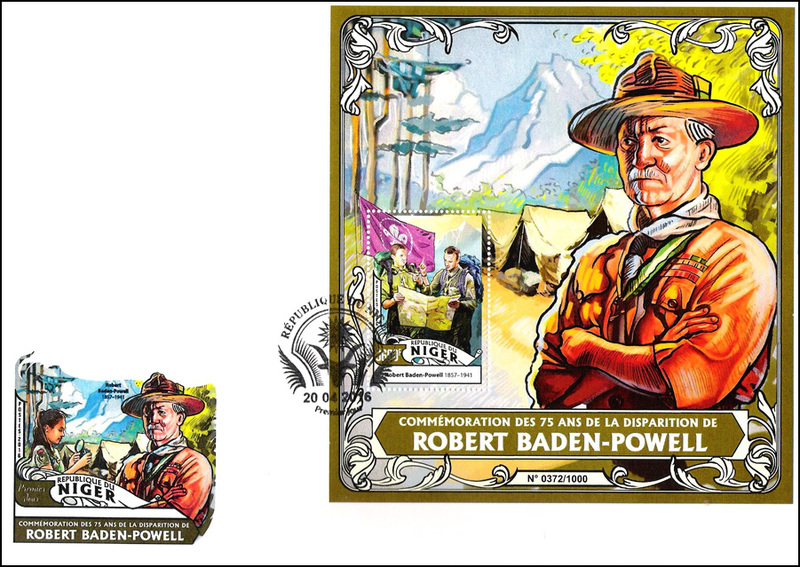 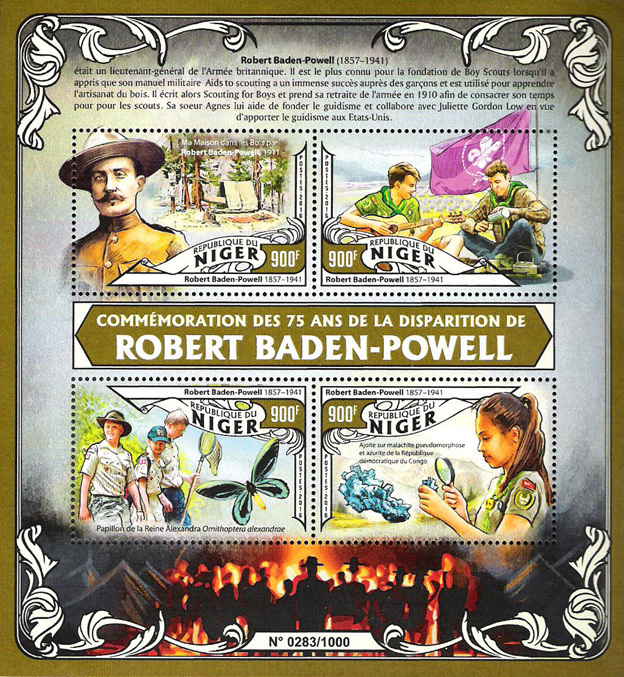 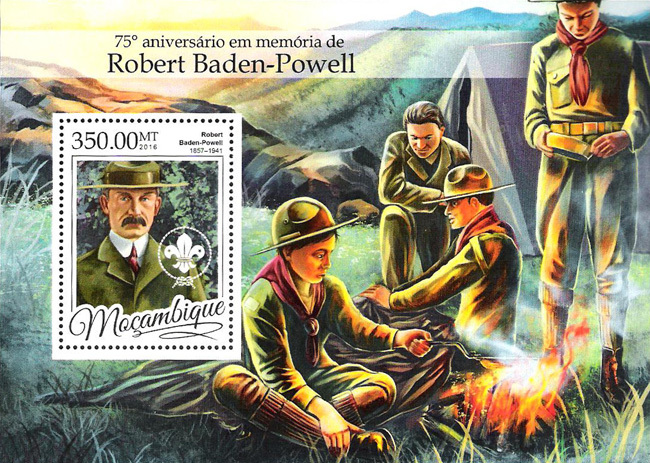 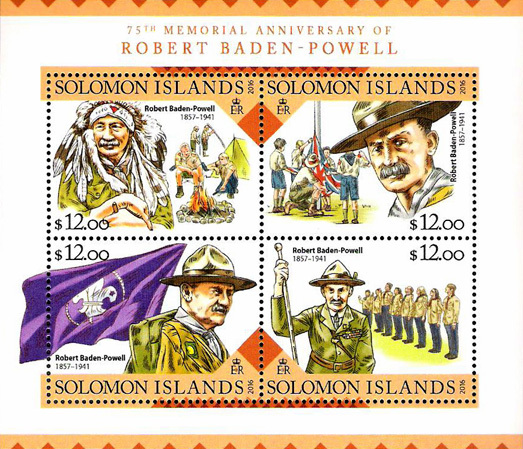 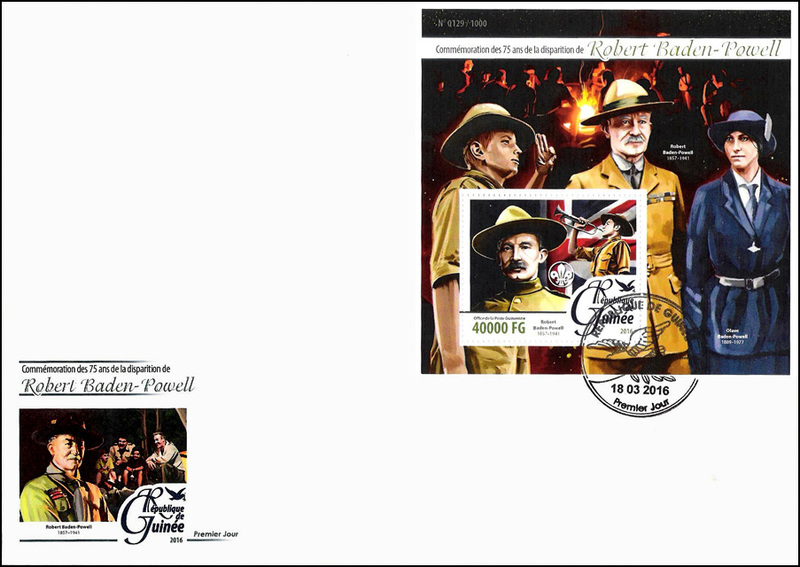 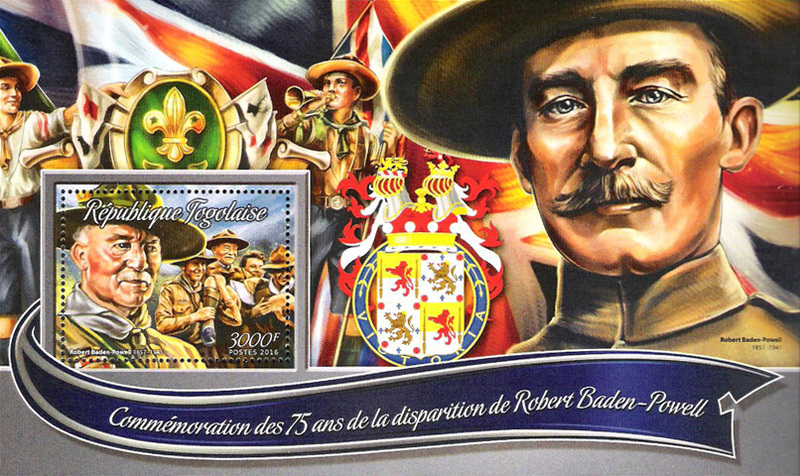 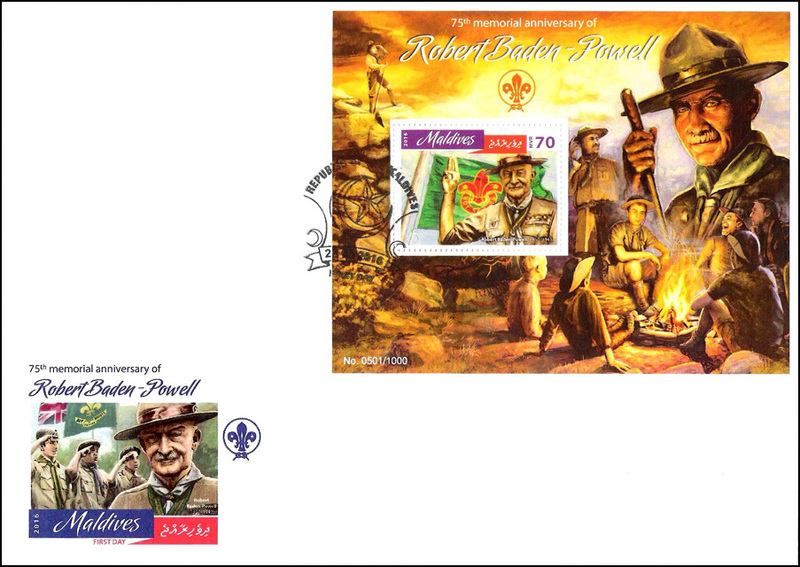 MS of 4 and SS (perf & imperf) for commemoration of 75th anniversary of death of B-P. B-P is depicted in 3 of stamps in MS (one with Scouts and one with the Boy Scouts of America badge). 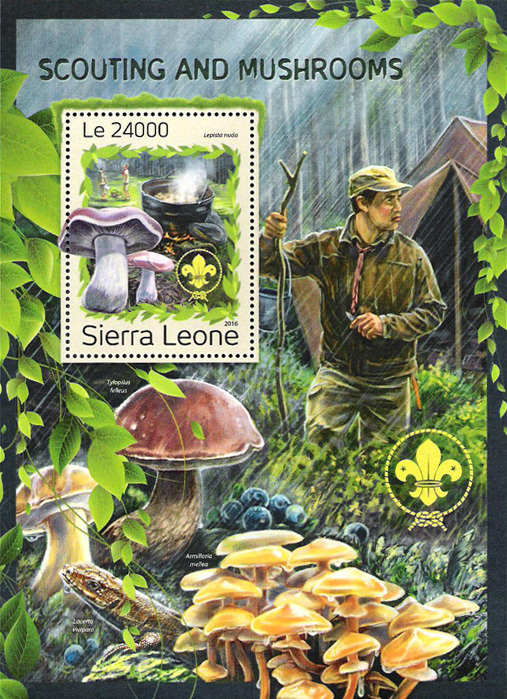 The other stamp shows Scout cooking. 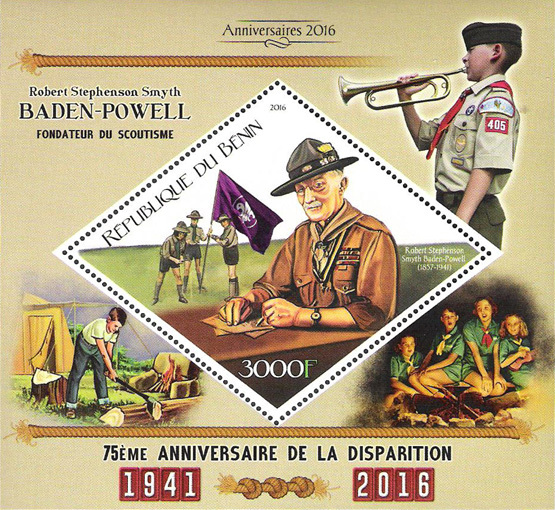 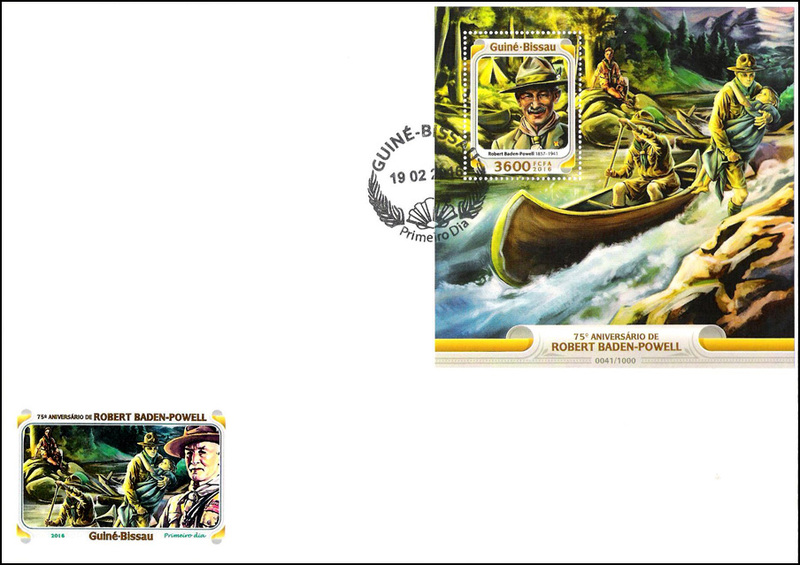 The SS depicts B-P in the stamp and in the selvage with Scouts. 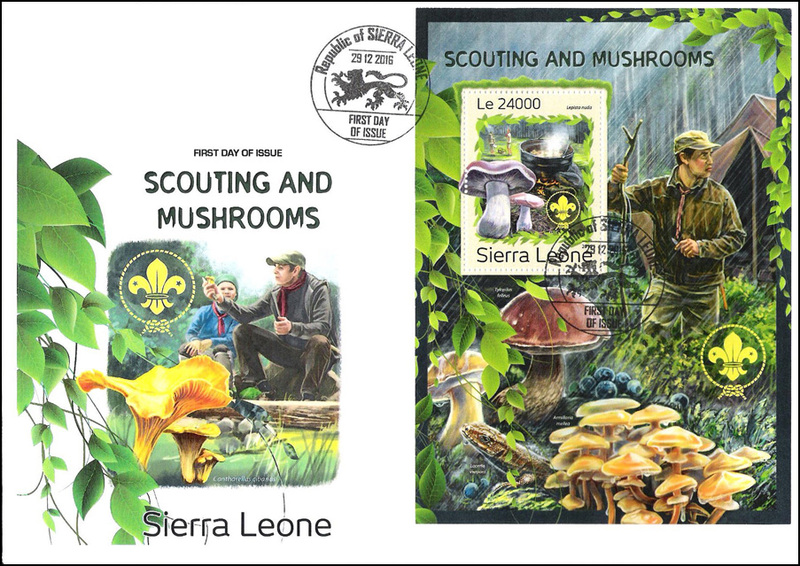 MS of 4 and SS (perf & imperf) depicting Scouts and different types of mushrooms in MS and SS. 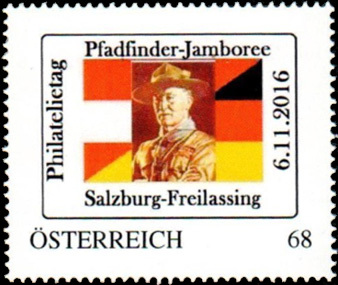 Stamp issued for Philatelic Day at Pfadfinder - Jamboree at Salzburg-Freilassing, 11 June 2016. 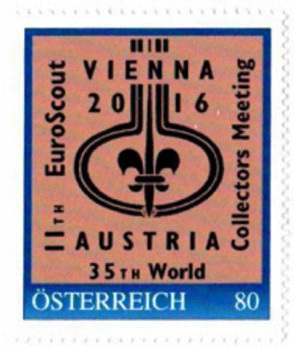 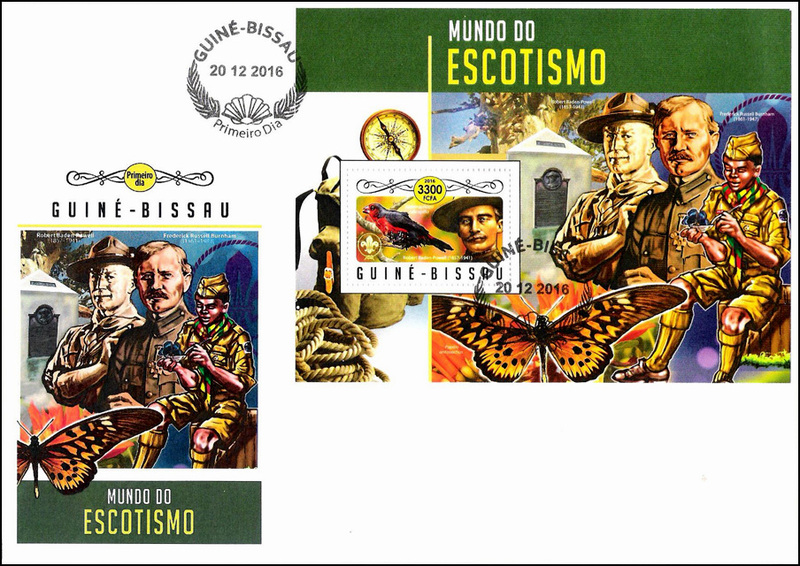 Stamp issued for the 11th EuroScout, International Scout Stamps Exhibition, and 35th World Collectors Meeting from 26 - 29 May 2016 in Vienna, Austria. 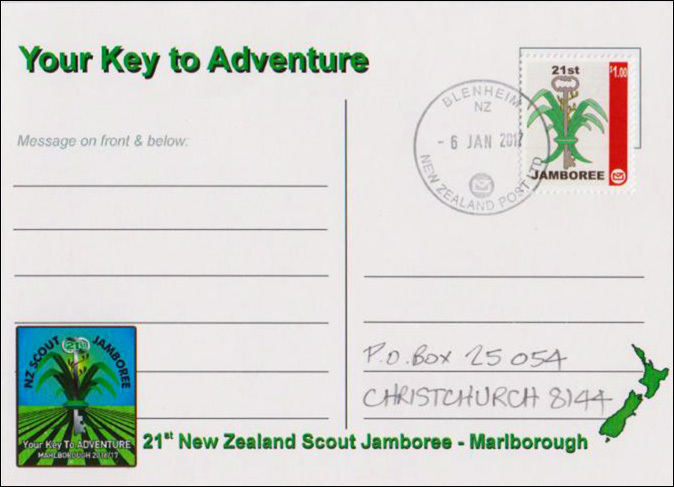 A personalized stamp called a CAL (Customer Advertising label) was authorized for the 21st New Zealand Scout Jamboree held from 29 December 2016 - 7 January 2017 at Giessen Sports Ground in Renwick southwest of Blenheim near the Woodborne Air Force Base with about 3500 Scouts and 500 support staff. 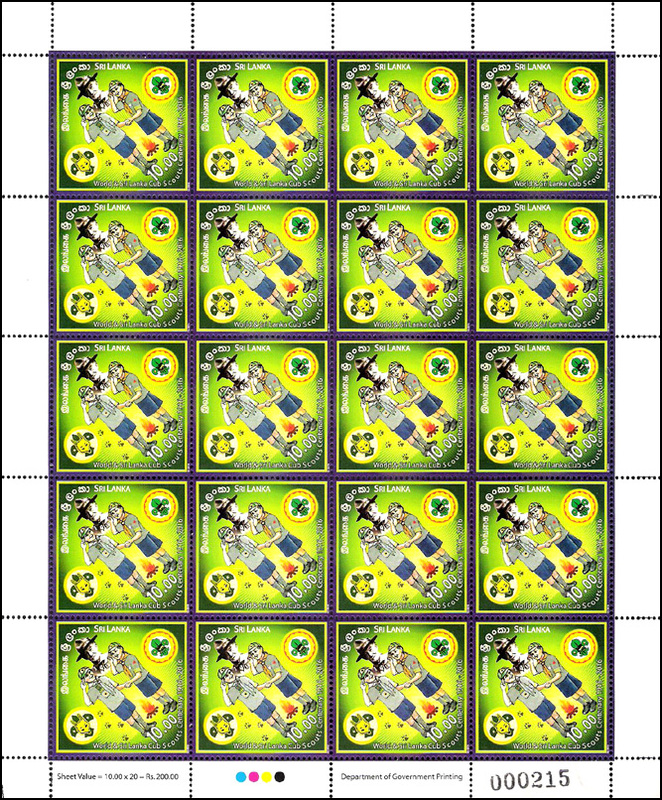 2500 stamps in 50 sheets were printed. 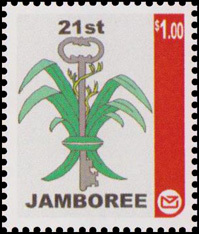 The design of flax leaves and key is a simplified version of the event logo.